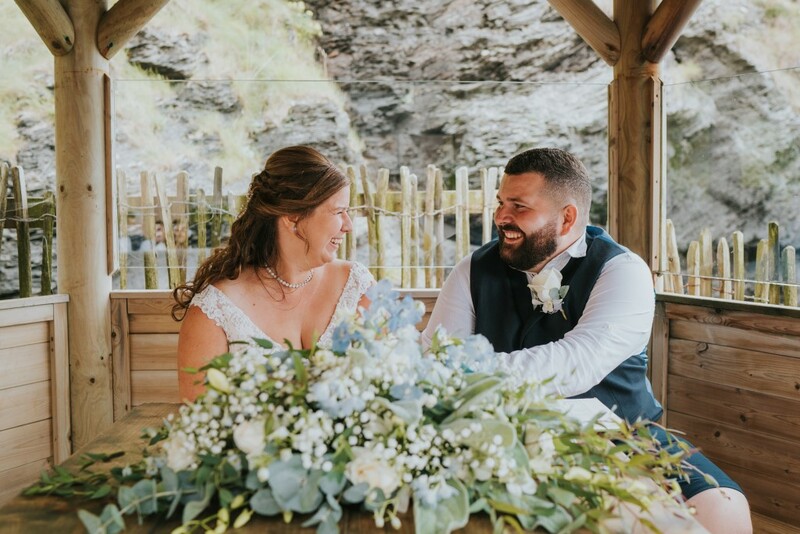 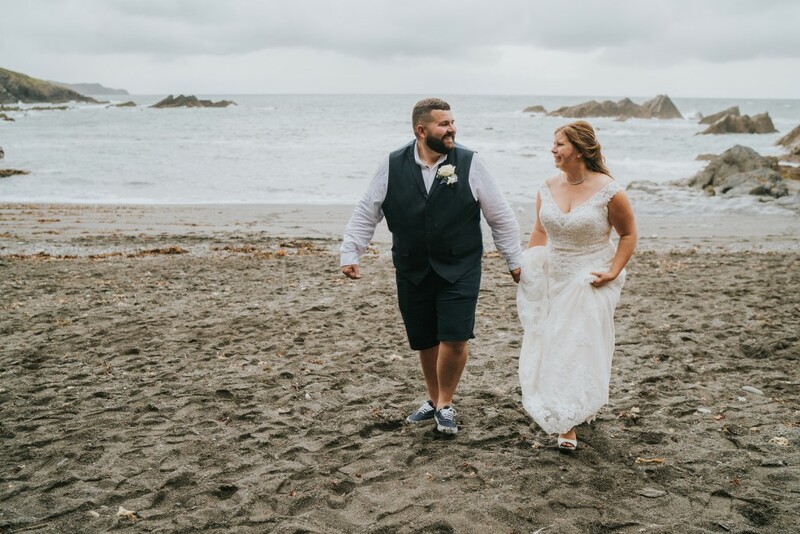 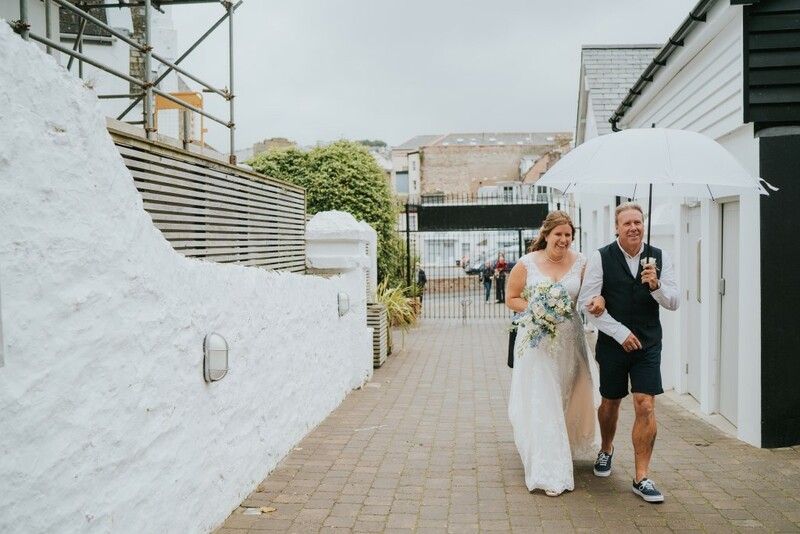 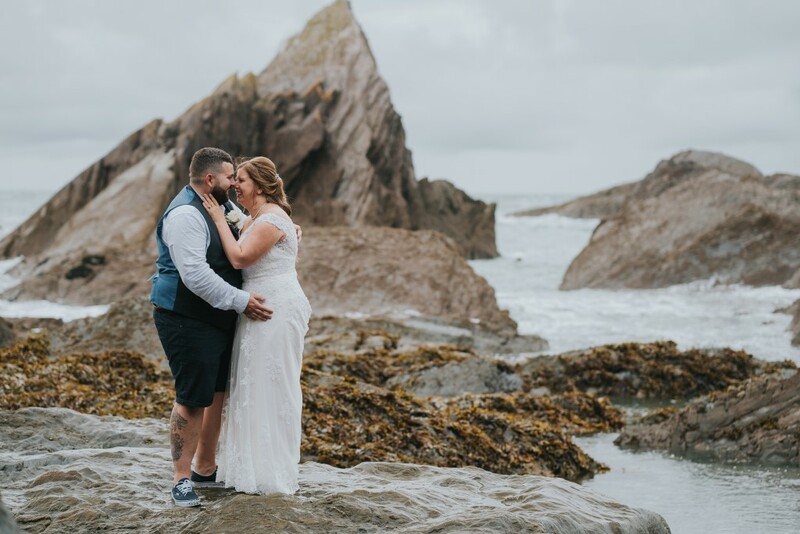 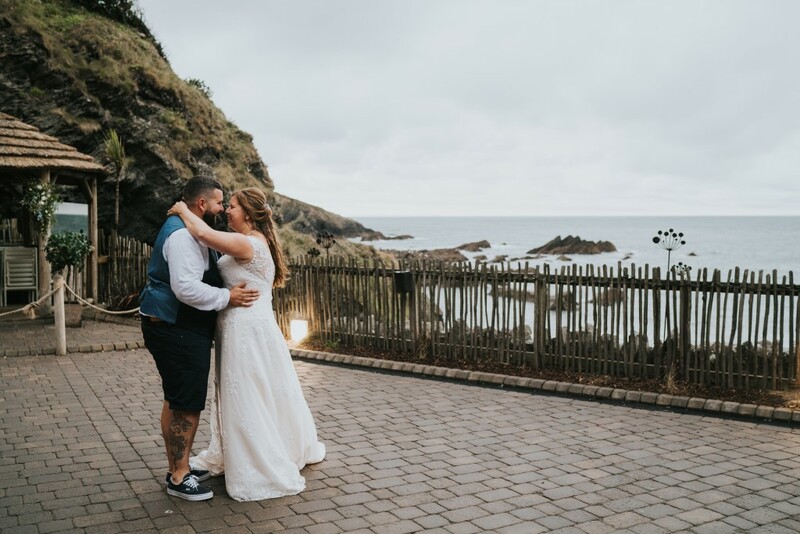 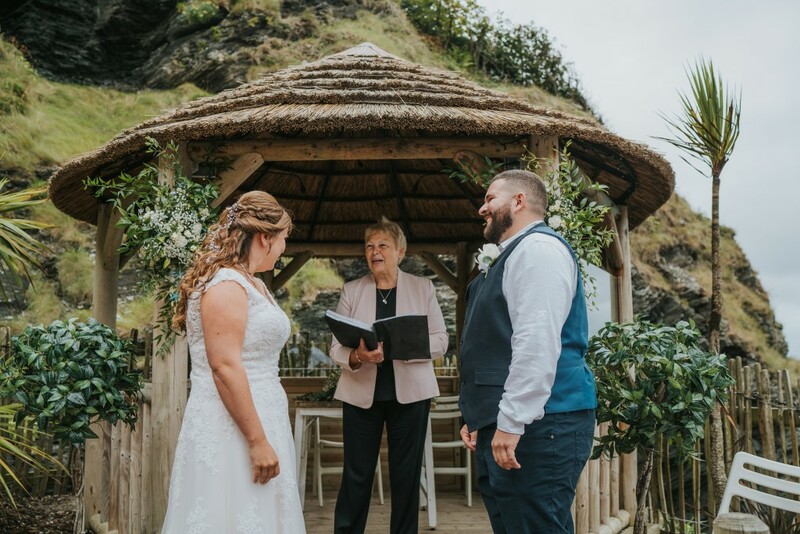 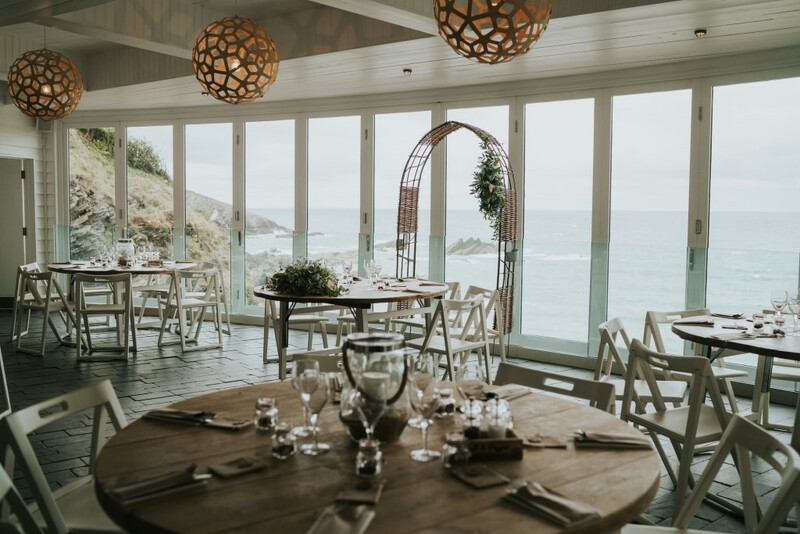 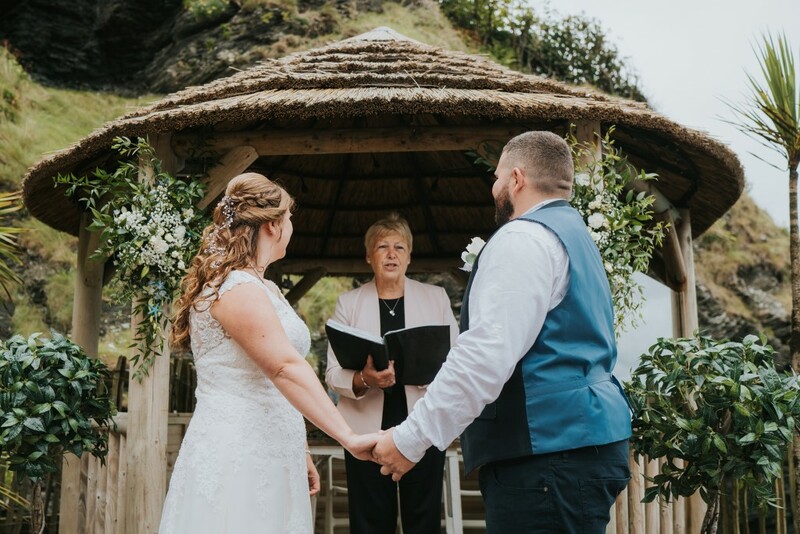 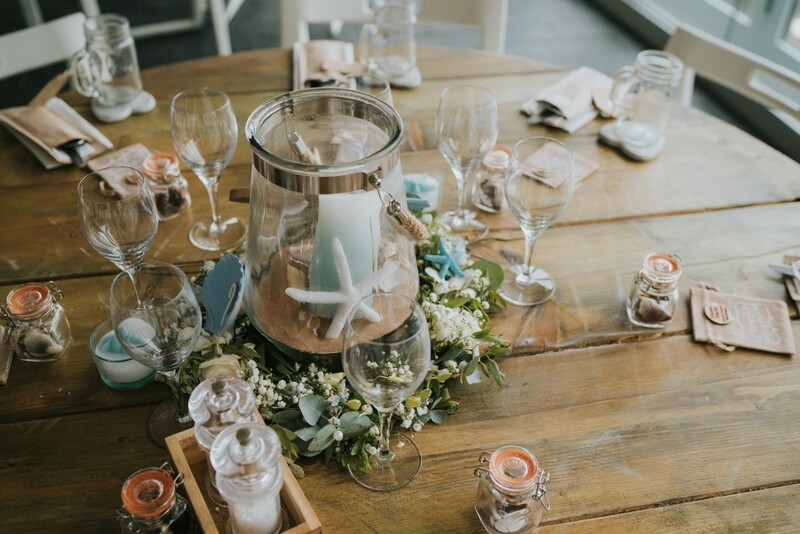 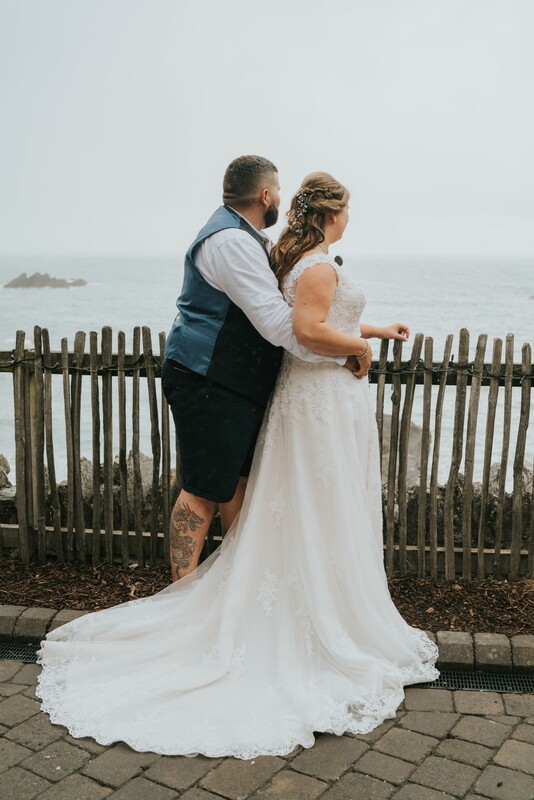 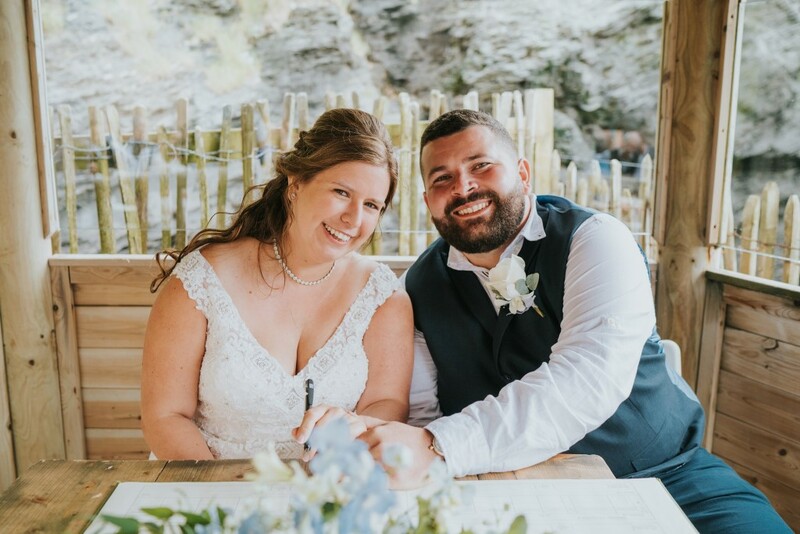 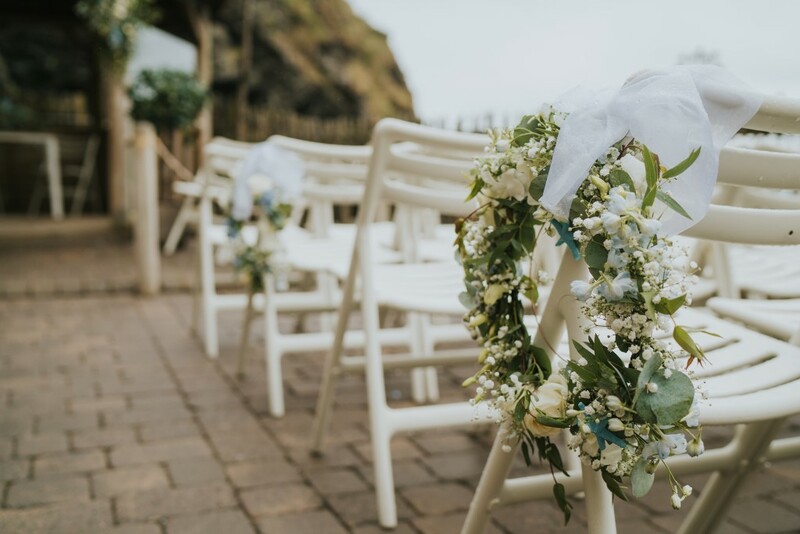 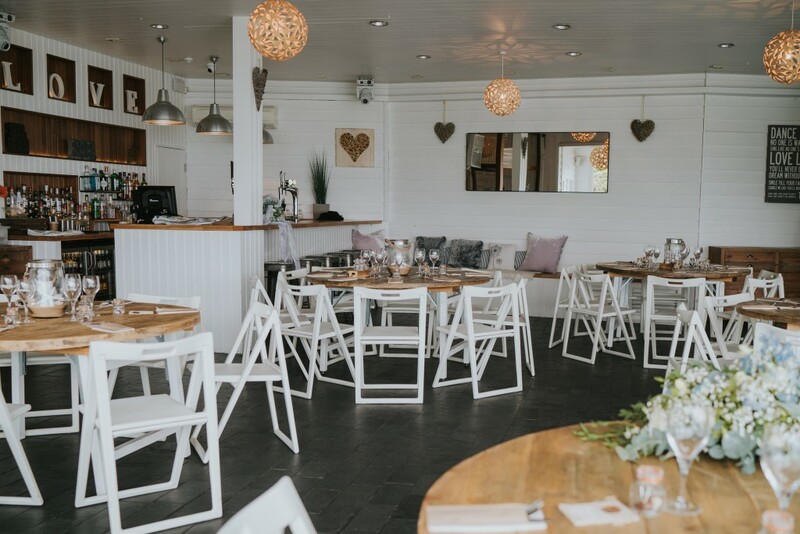 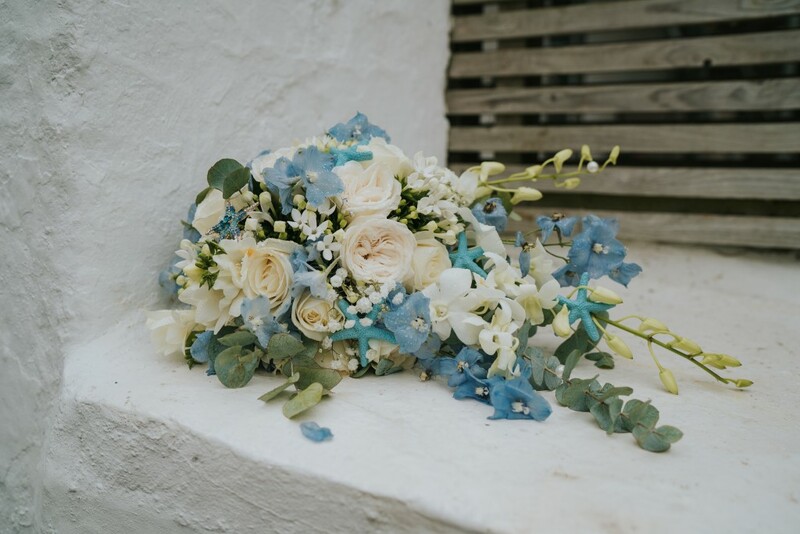 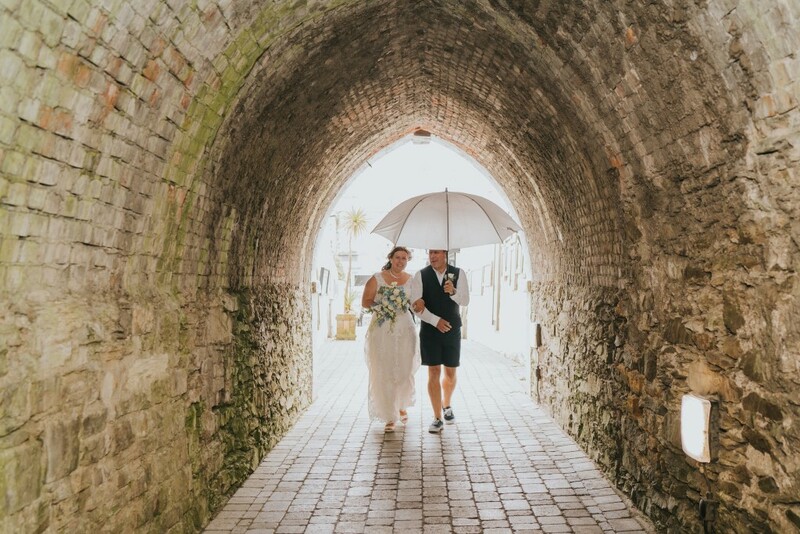 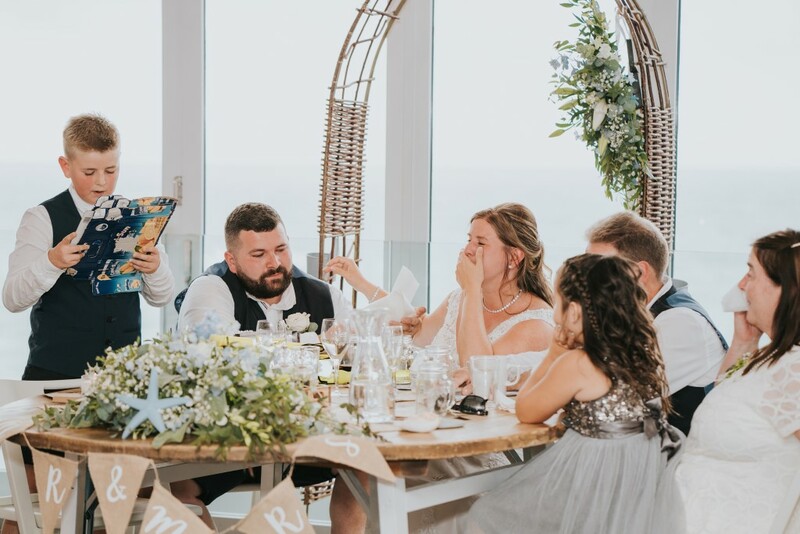 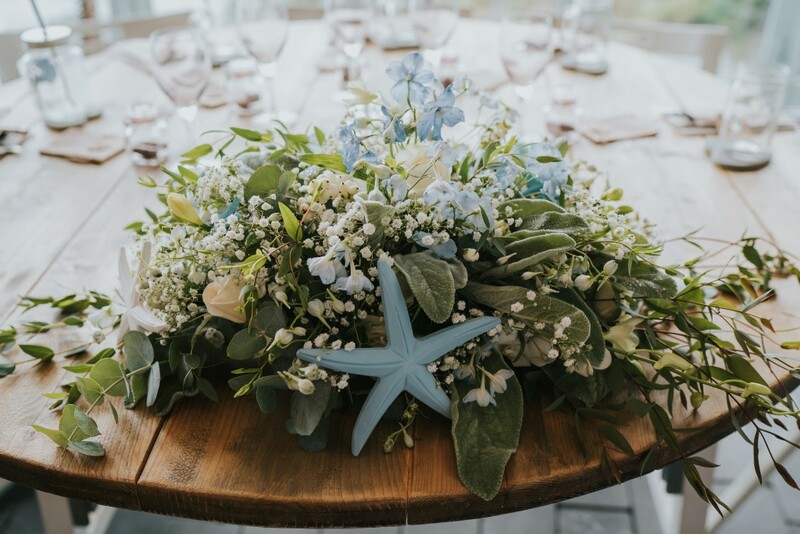 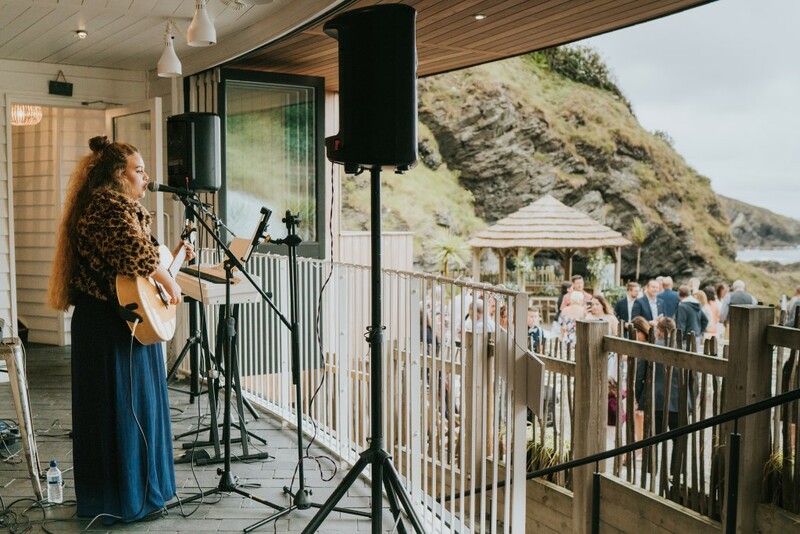 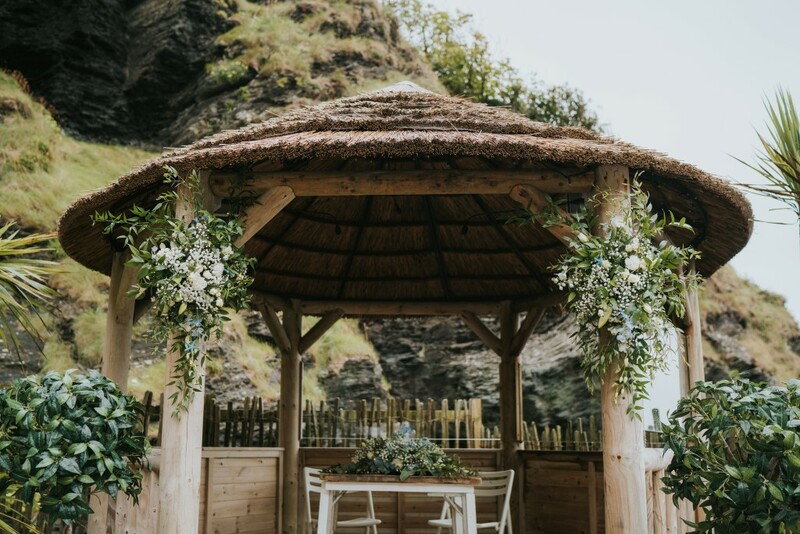 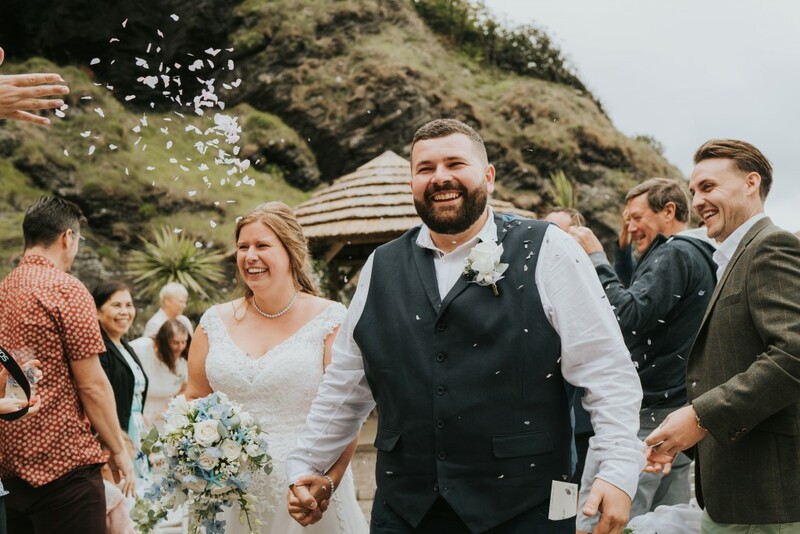 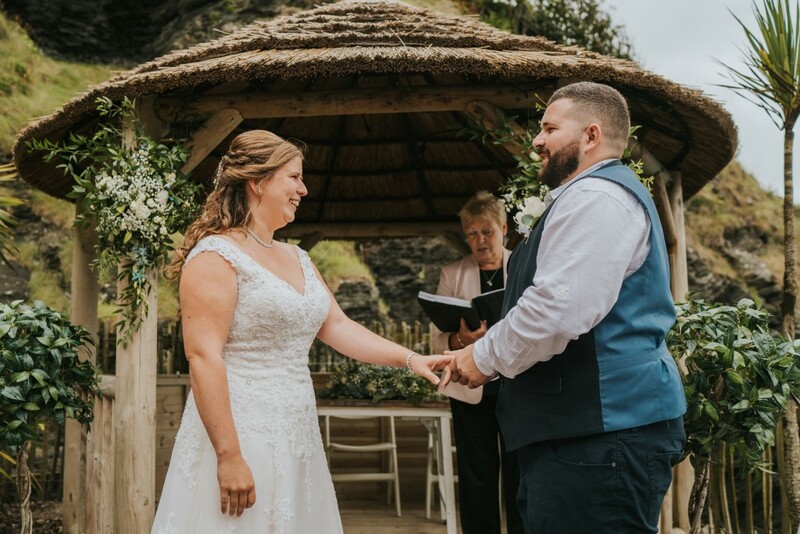 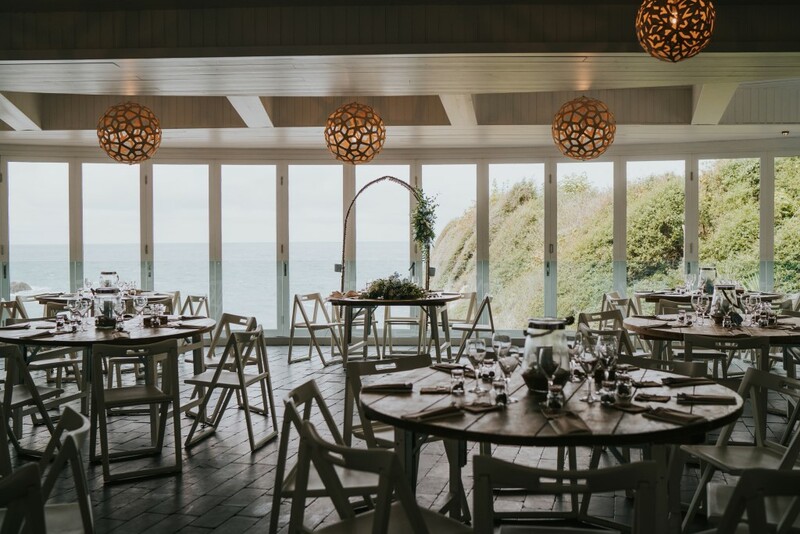 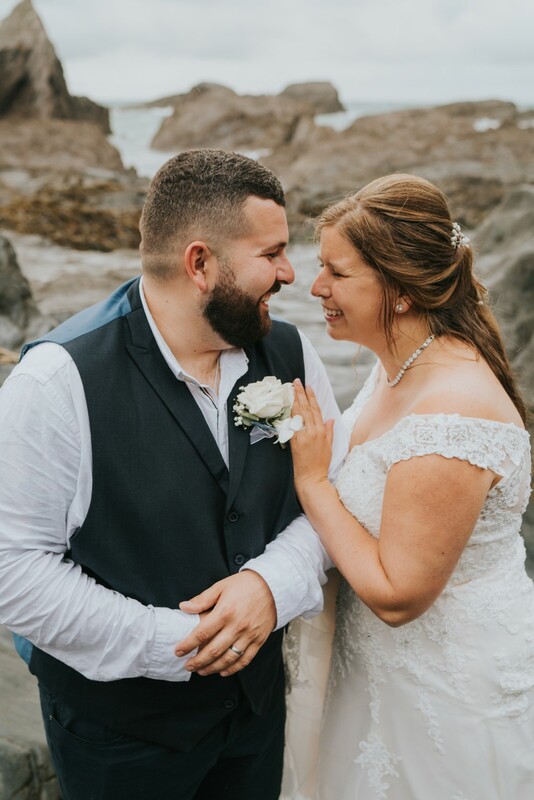 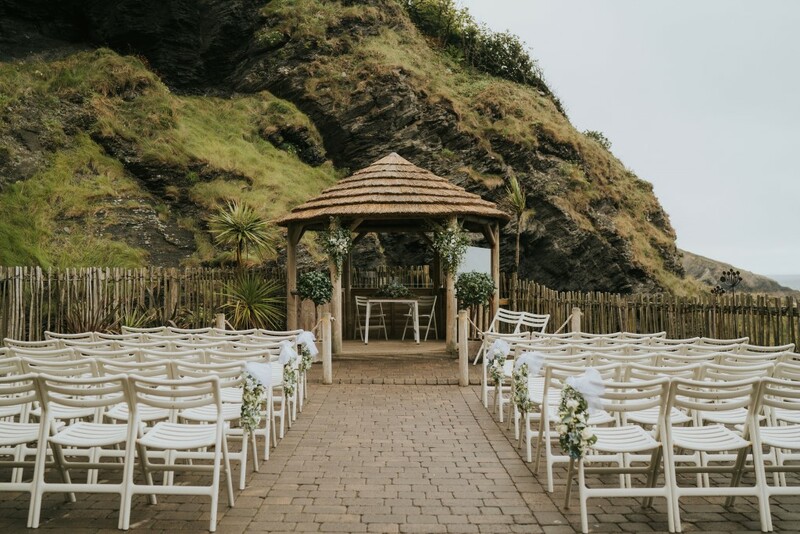 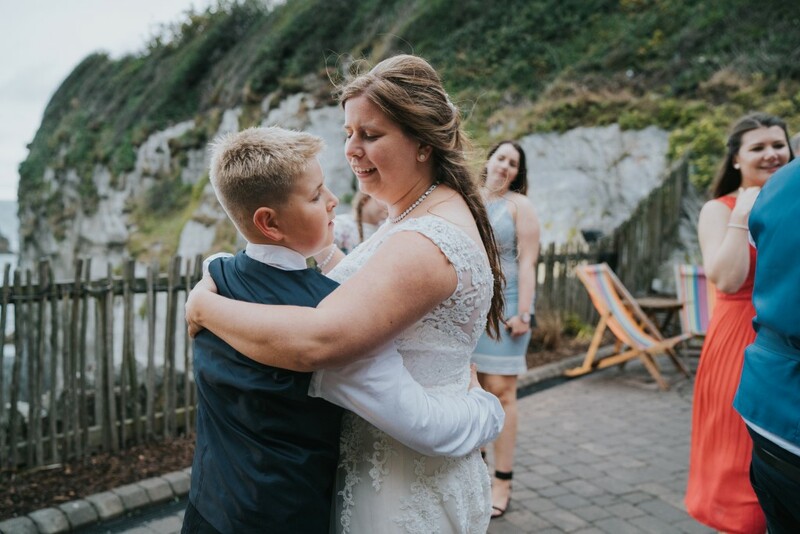 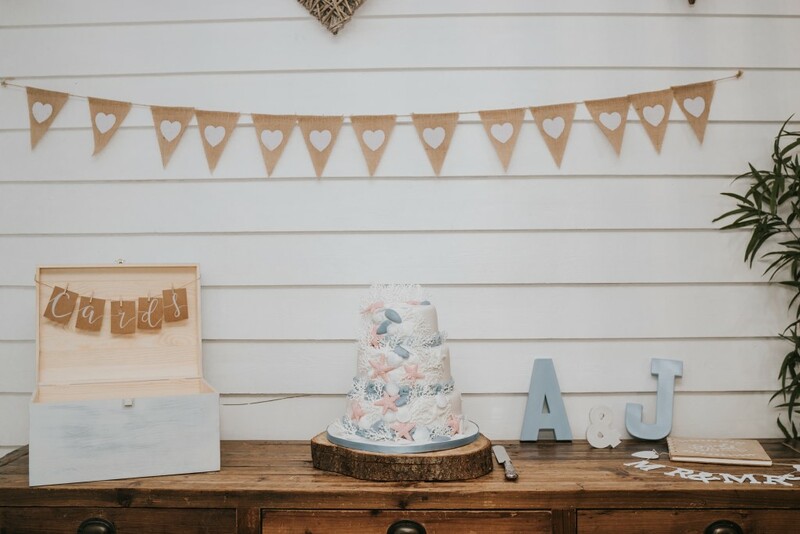 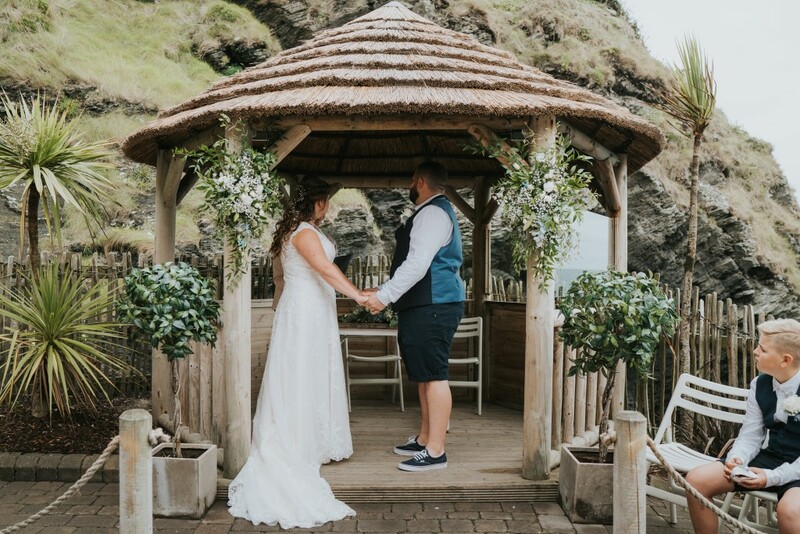 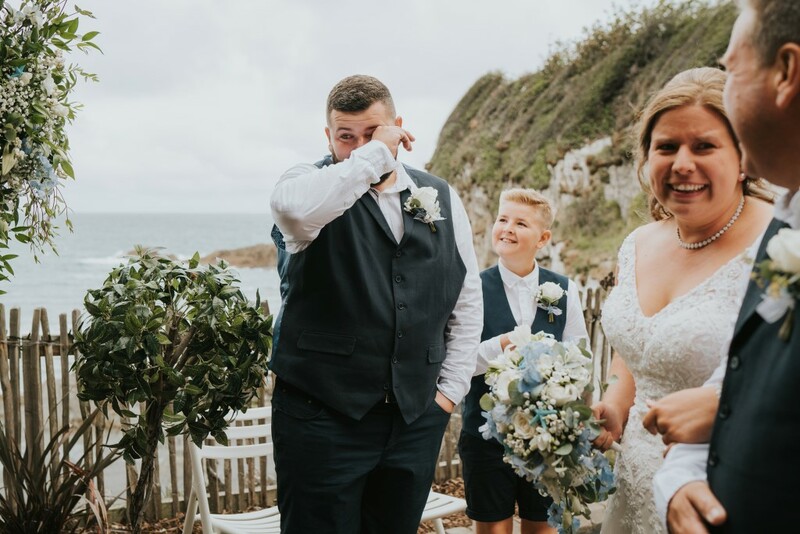 Today I am thrilled to share this gorgeous rainy Devon Wedding at Tunnels Beaches with beautiful blue accents. 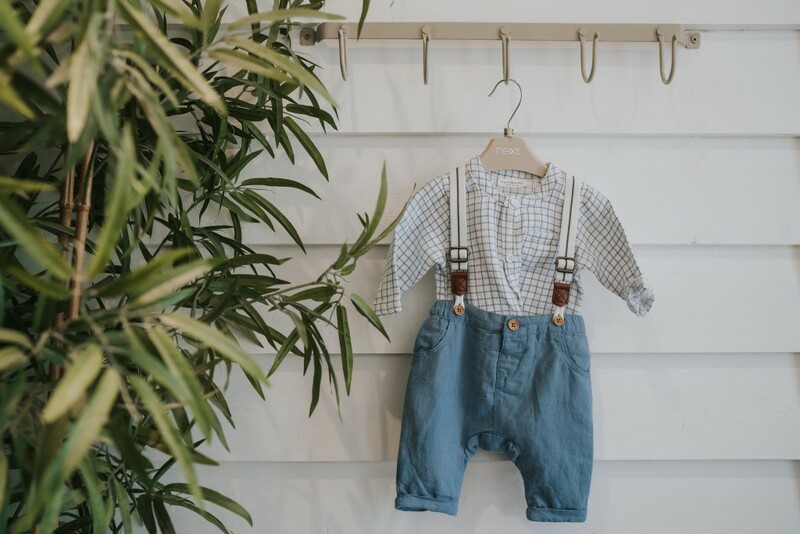 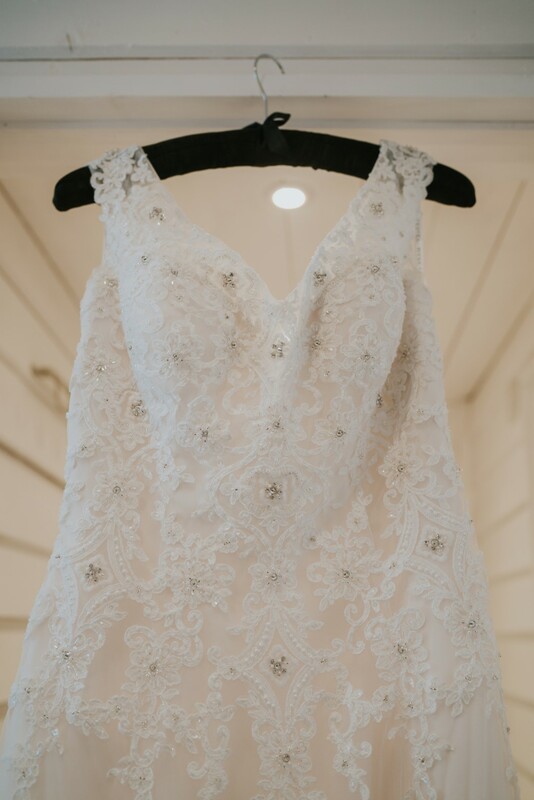 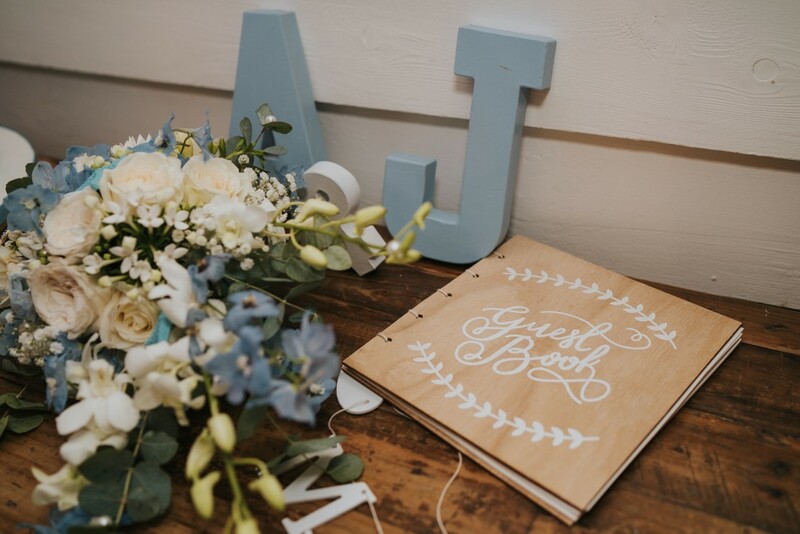 Images were captured by Grace Elizabeth Photography. 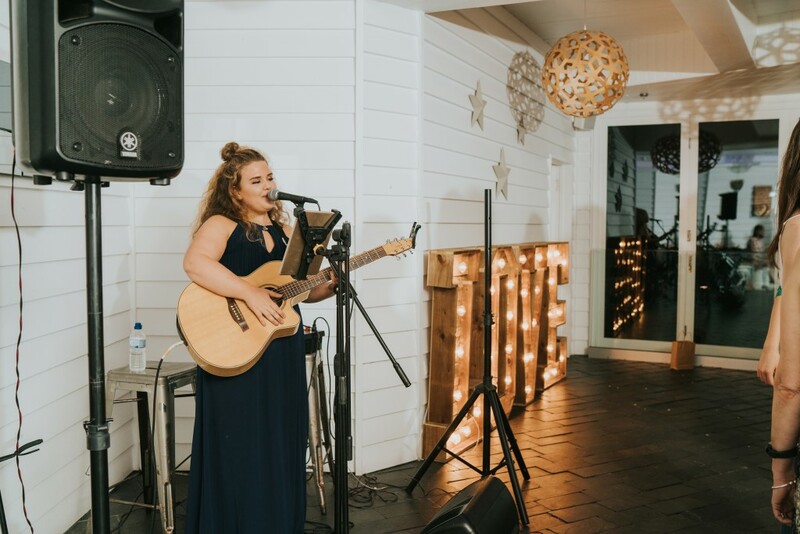 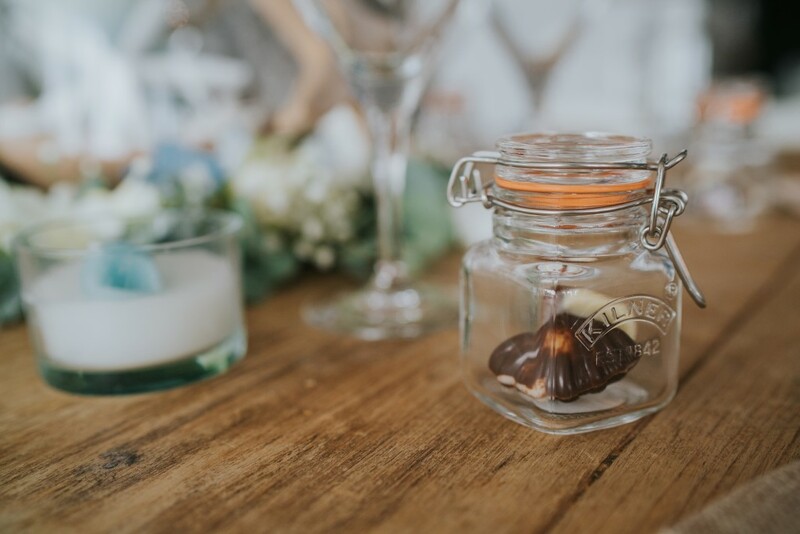 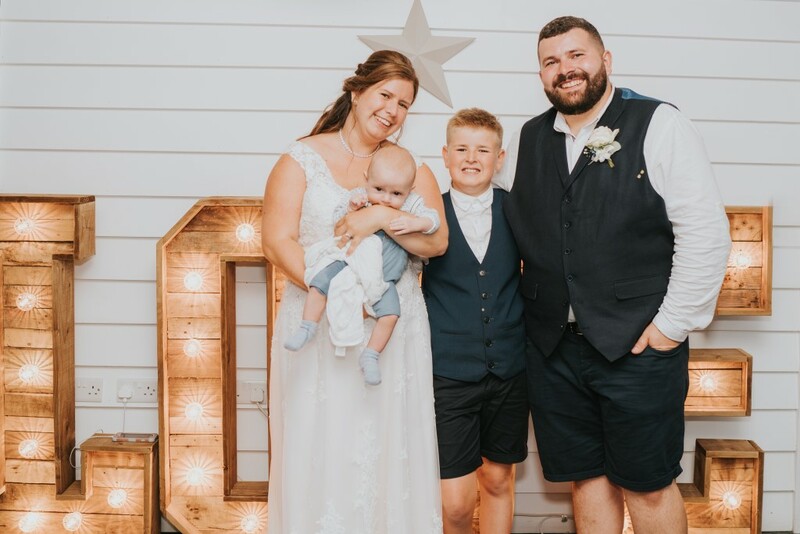 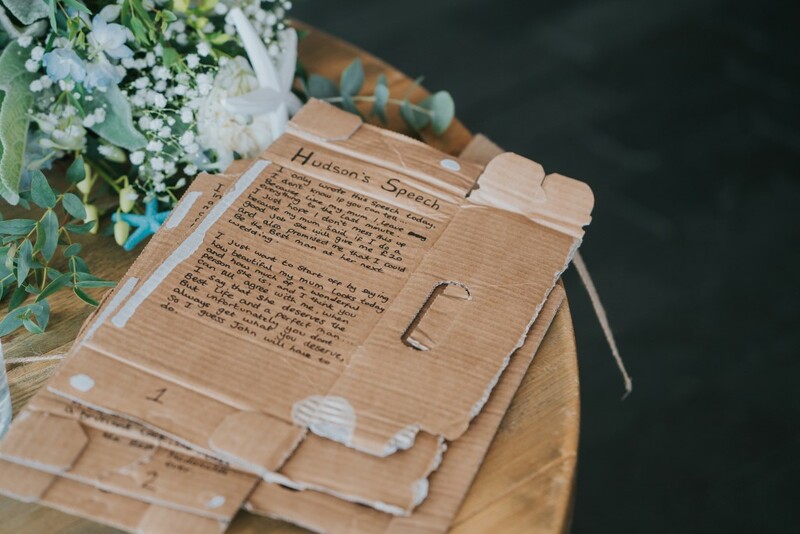 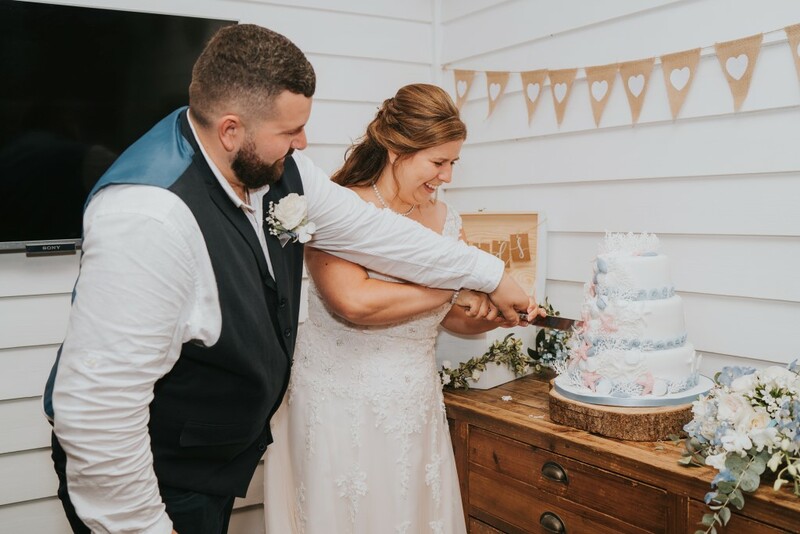 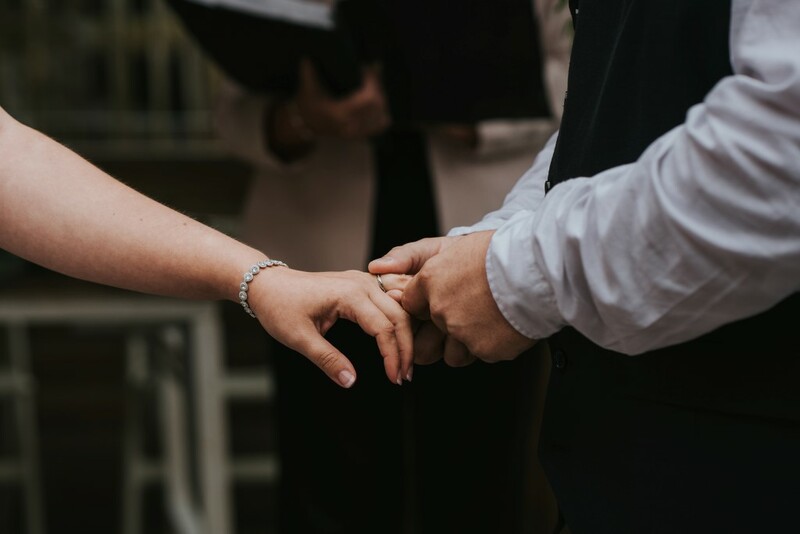 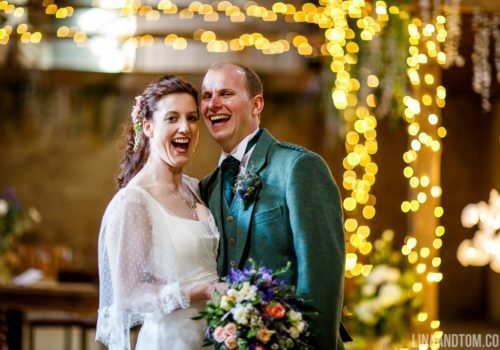 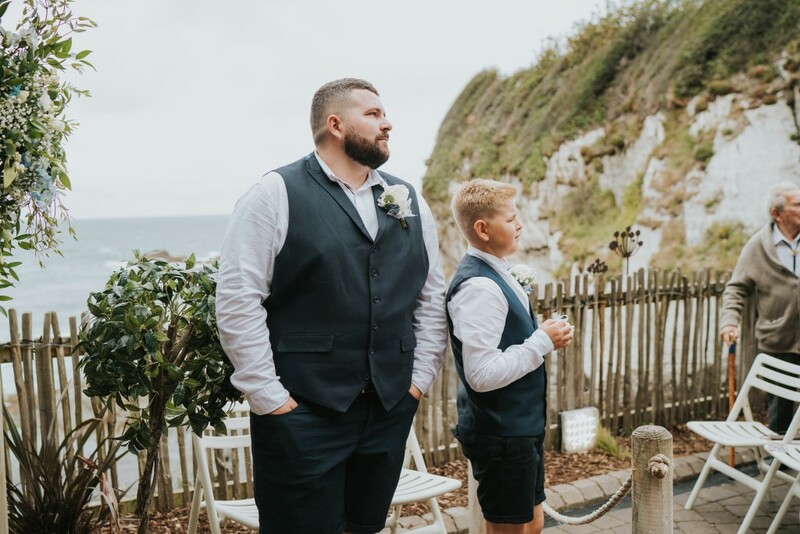 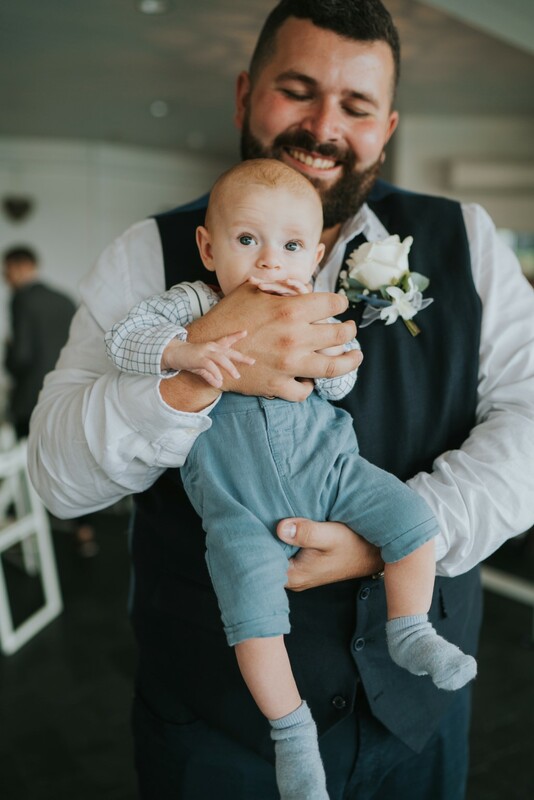 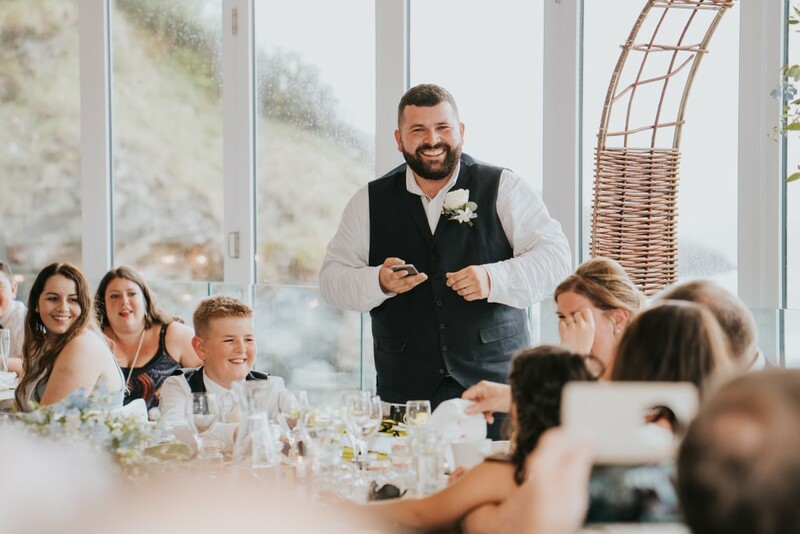 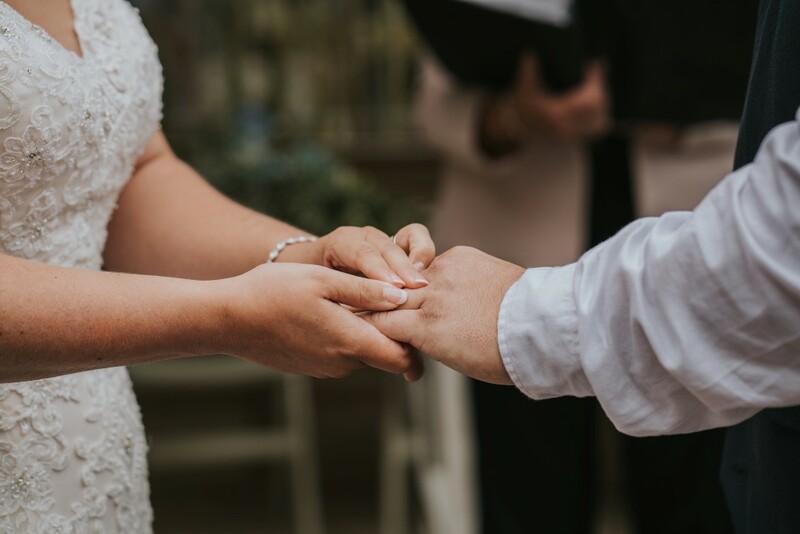 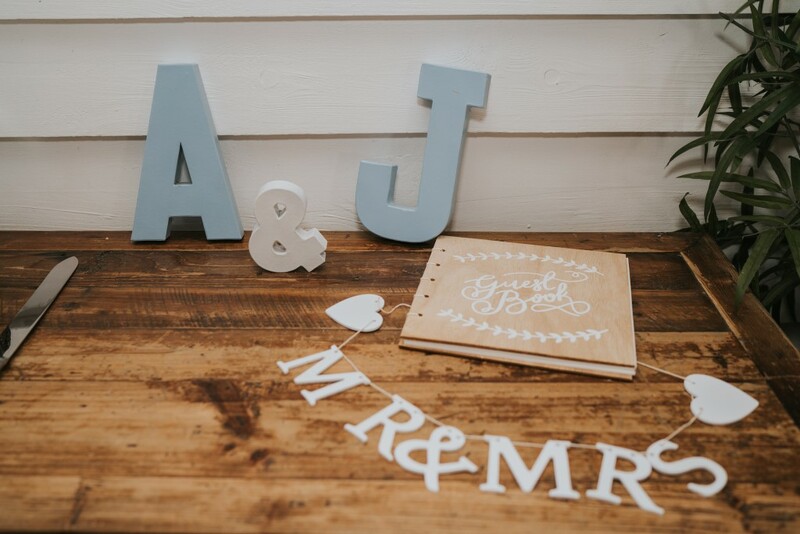 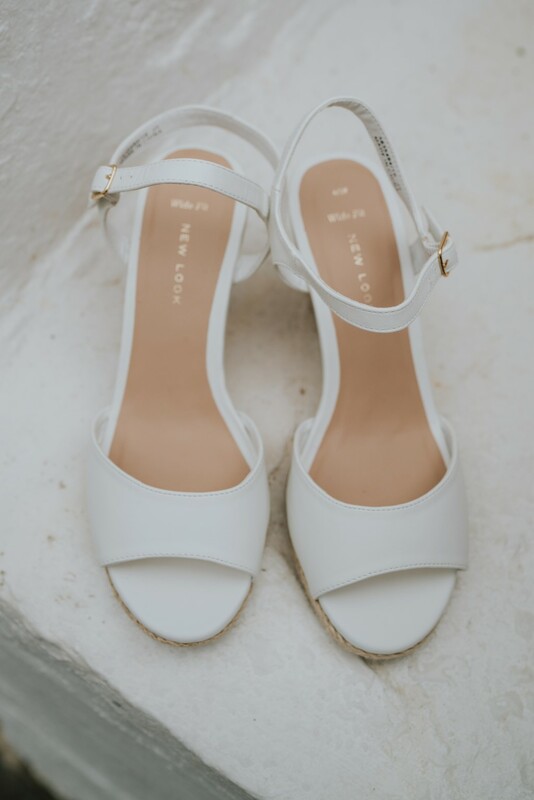 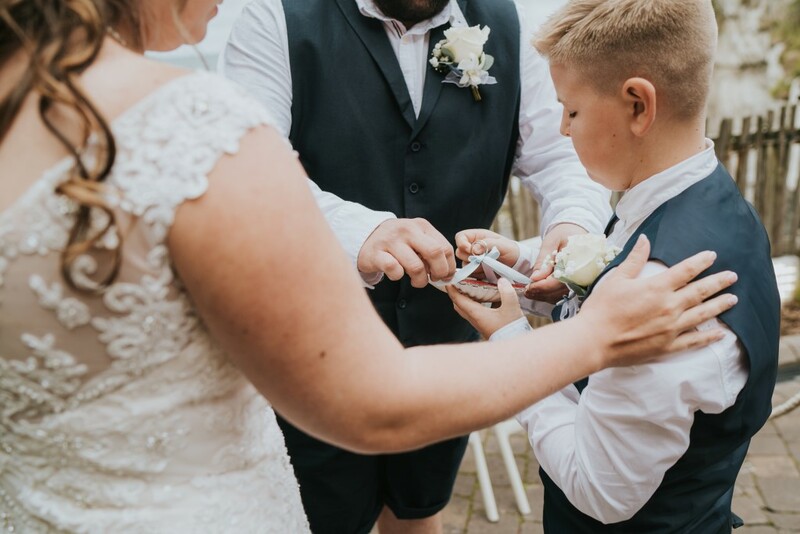 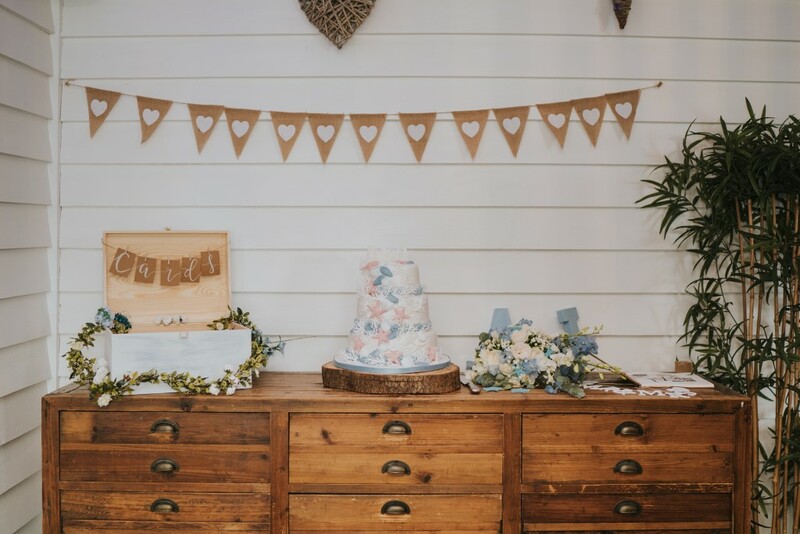 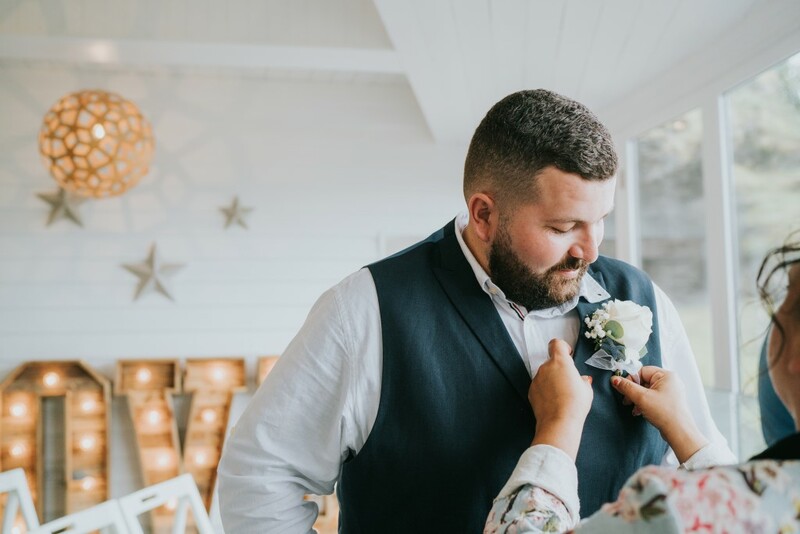 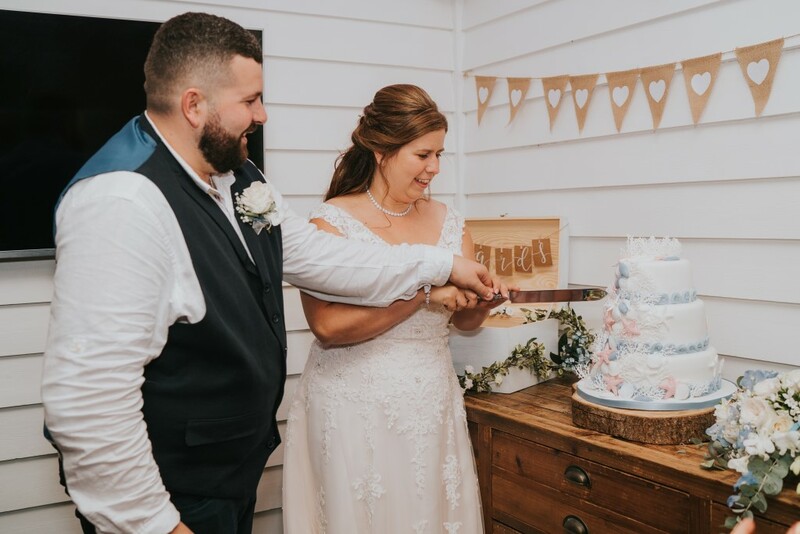 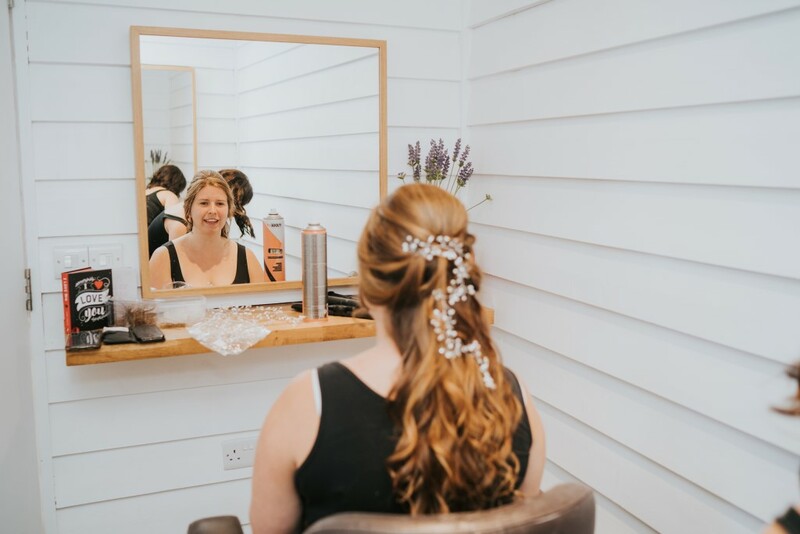 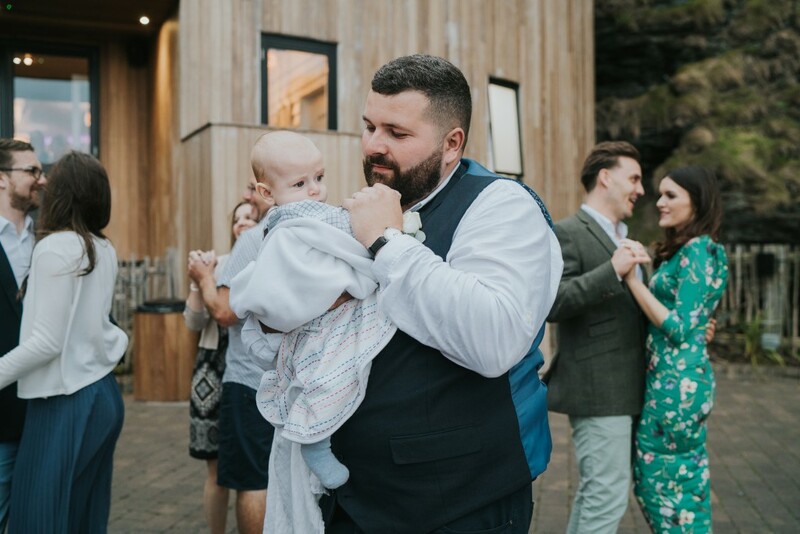 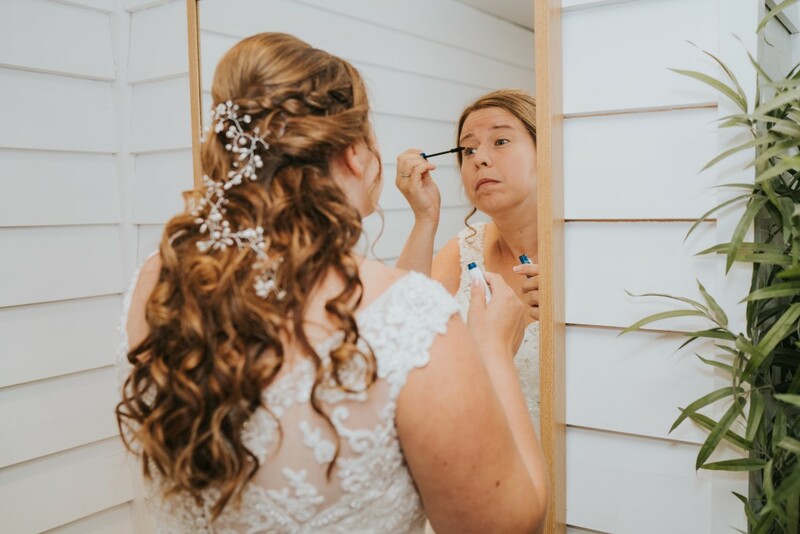 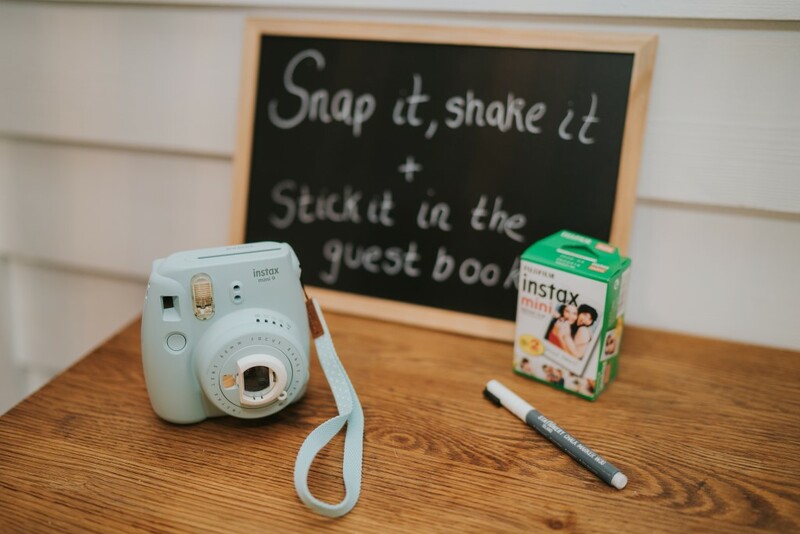 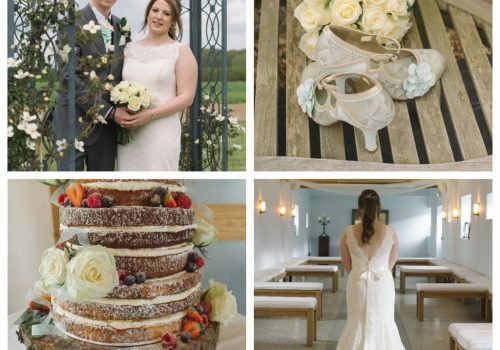 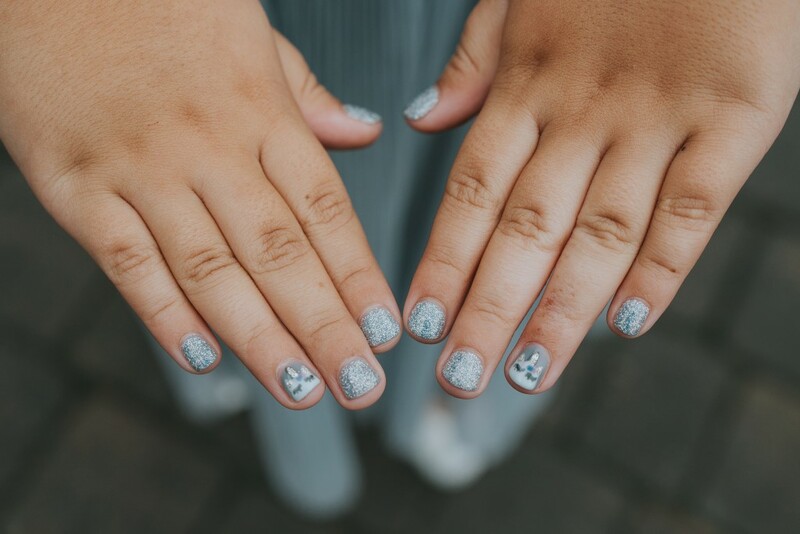 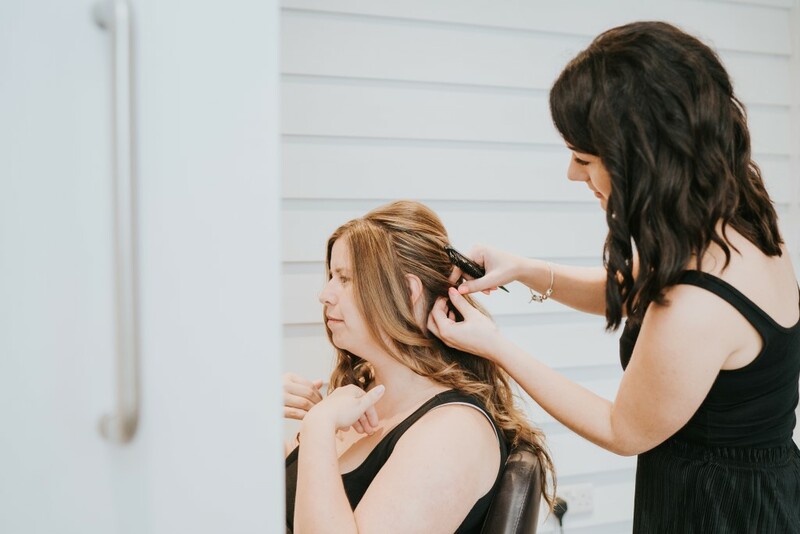 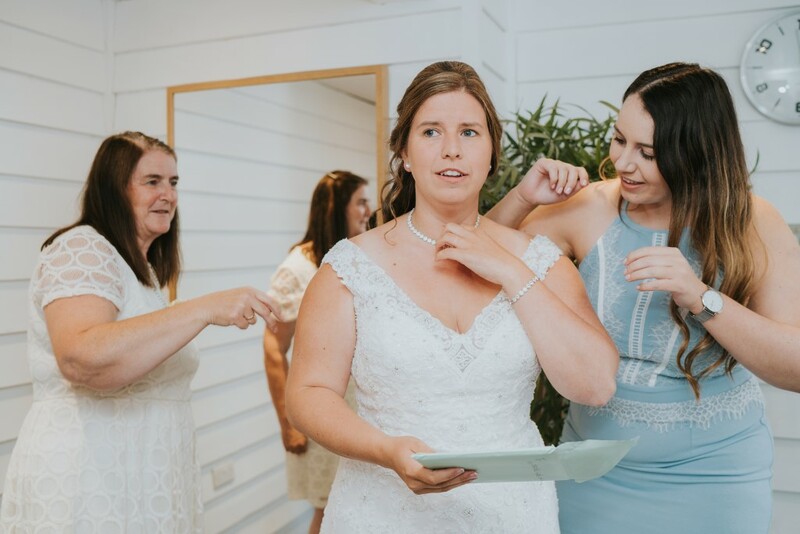 Grace Elizabeth is an an alternative wedding photographer with a flair for unobtrusive, natural, relaxed wedding. 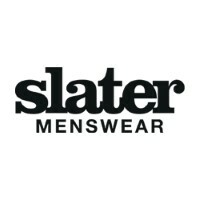 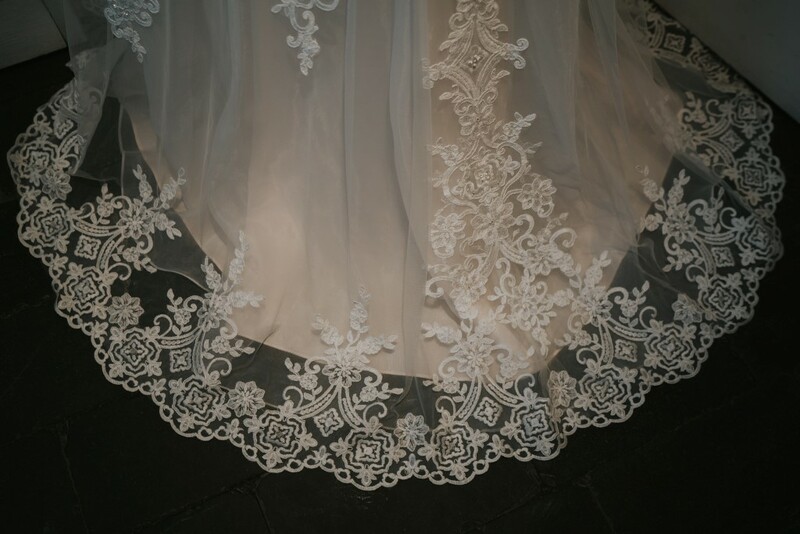 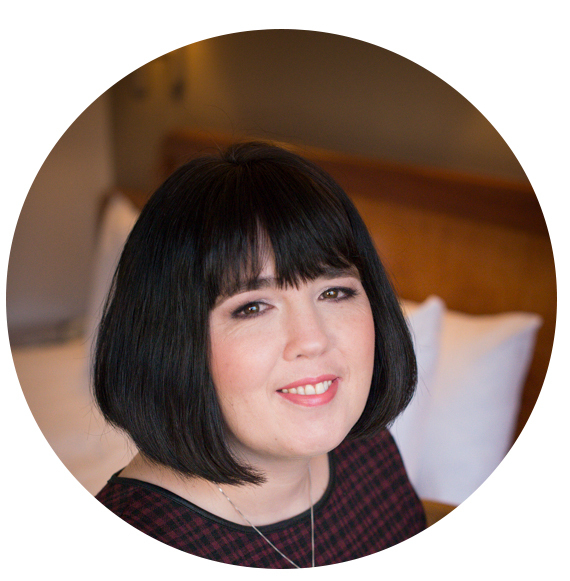 She is based in Colchester, Essex but often works in Suffolk, Norfolk, and North Devon. 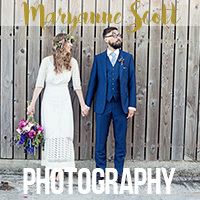 Along with a heart of wanderlust and a sense of adventure, she also adores travelling anywhere and everywhere.destination wedding and lifestyle photography. 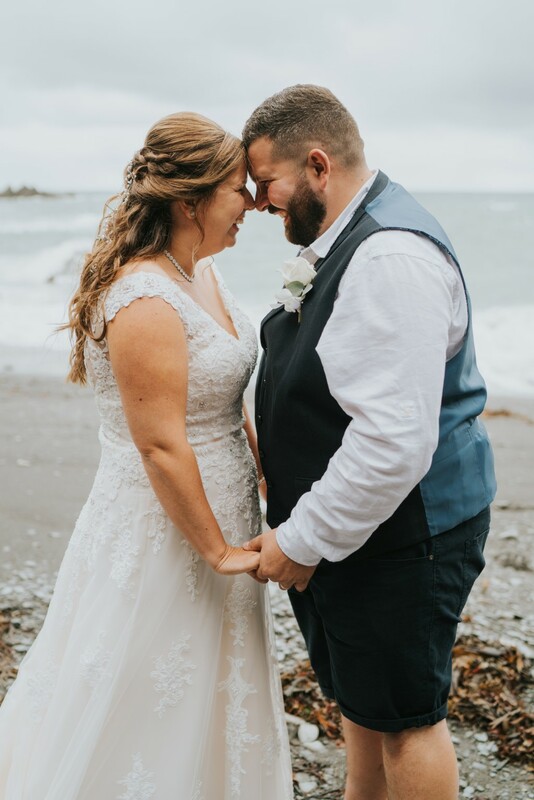 We met online. 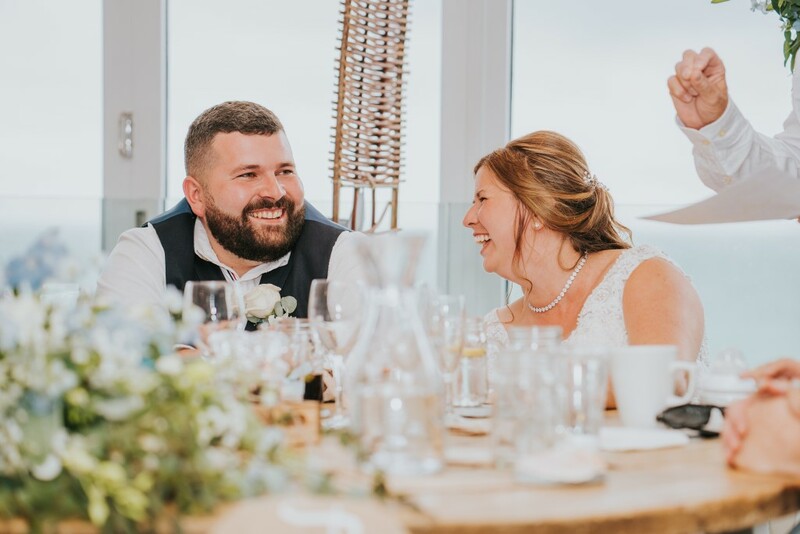 and our first date was at Mersea Beach. 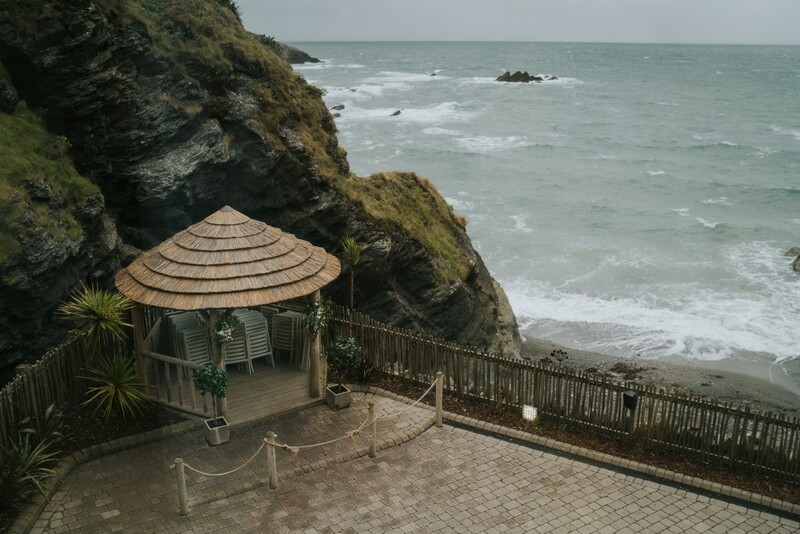 We were camping in Cornwall for the May half term with my sister and niece. 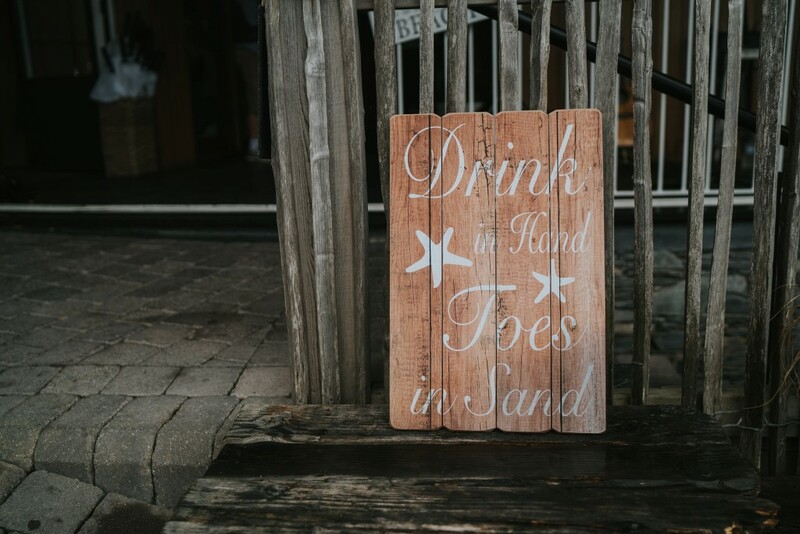 We went to the Watergate beach and I was walking and talking with my sister while John and Hudson walked towards the sea. 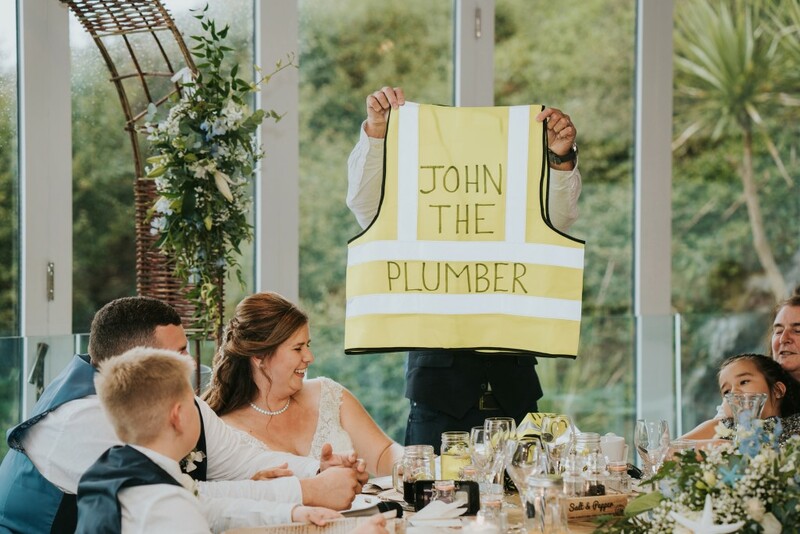 Next minute my sister told me that John is calling me. 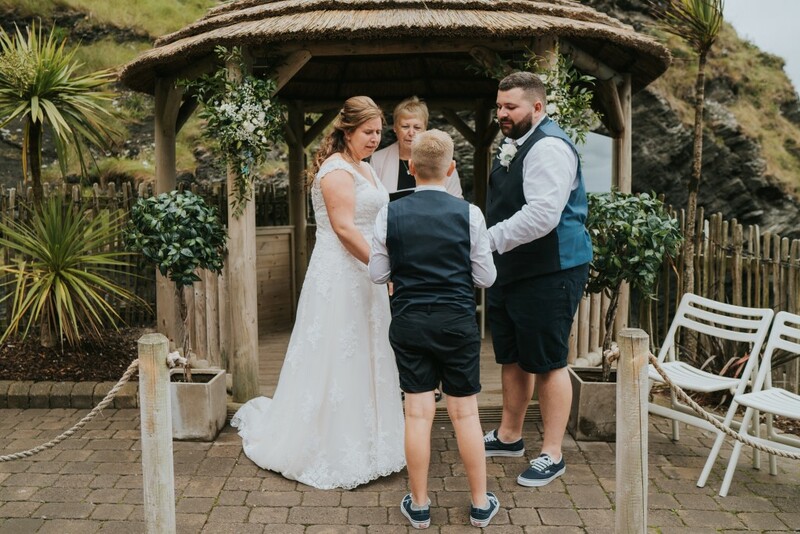 So I walked over to them and Hudson had written in the sand “Will you Marry Me” and John was down on one knee proposing. 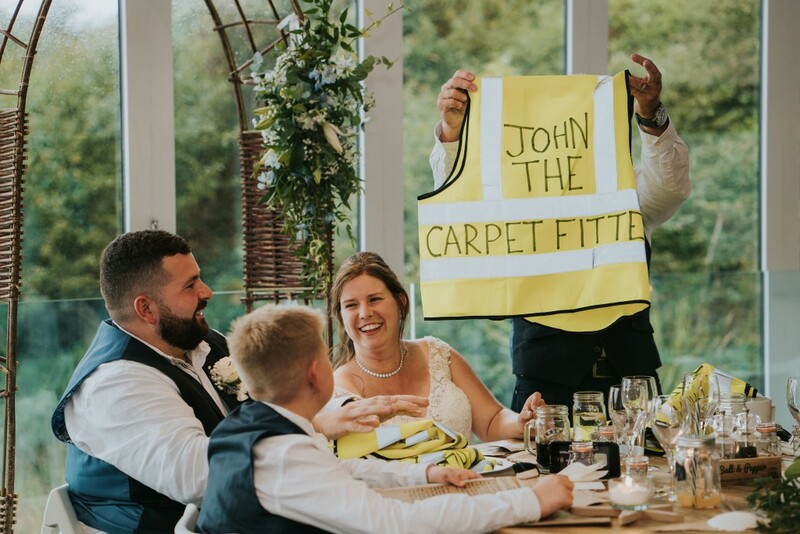 Obviously I said yes!! 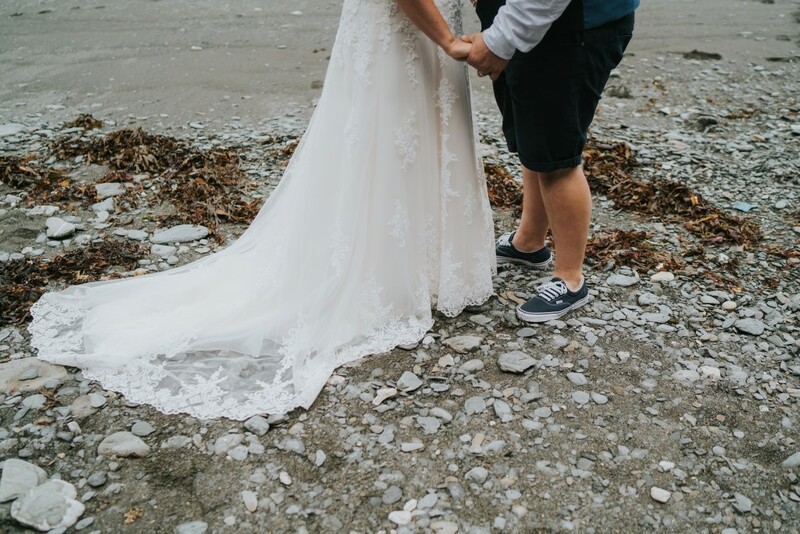 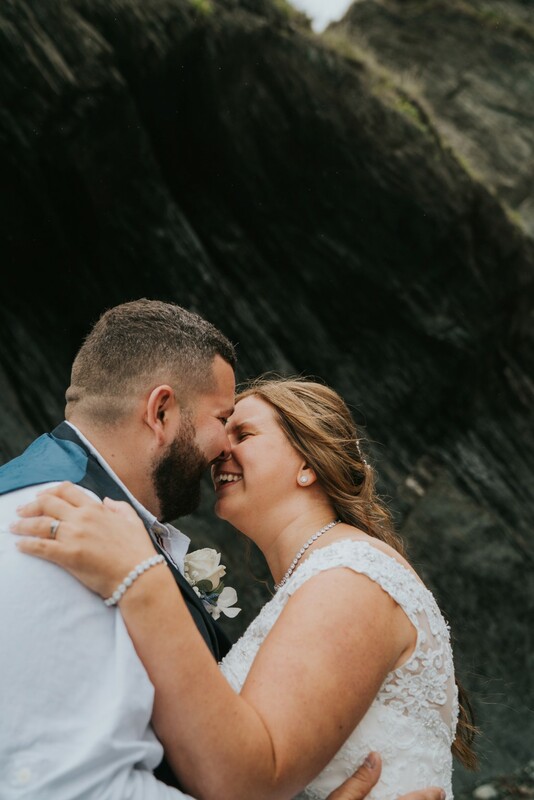 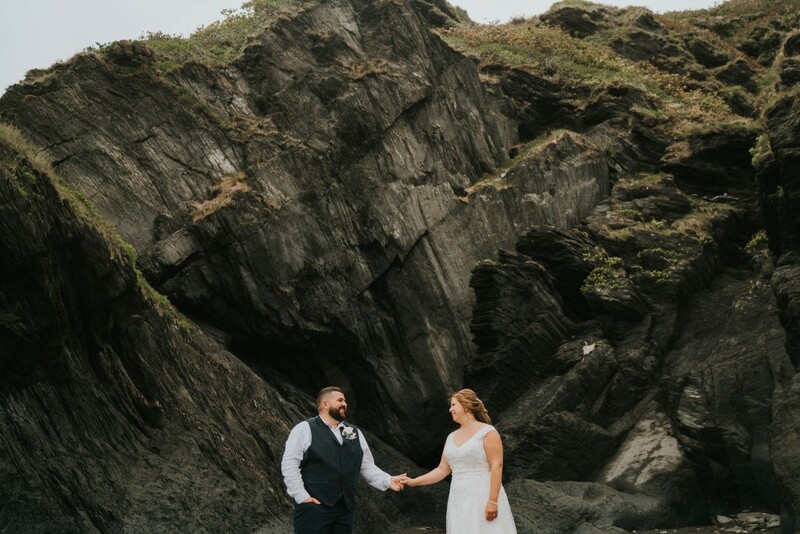 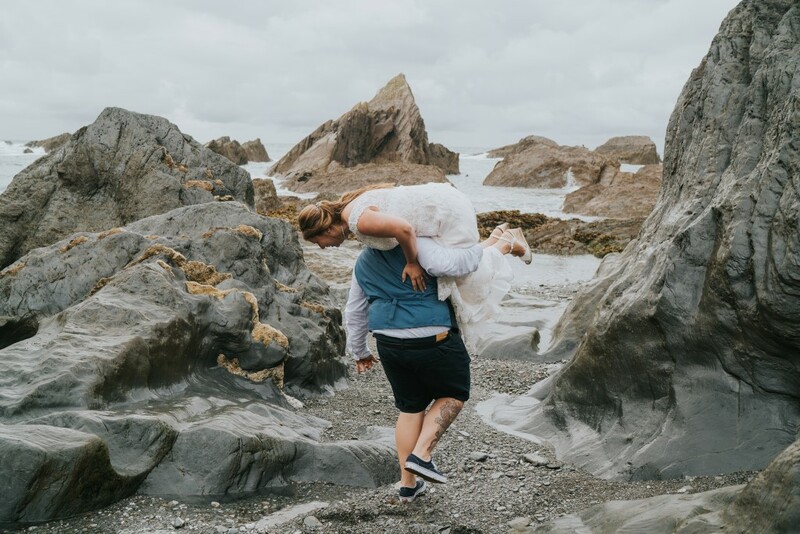 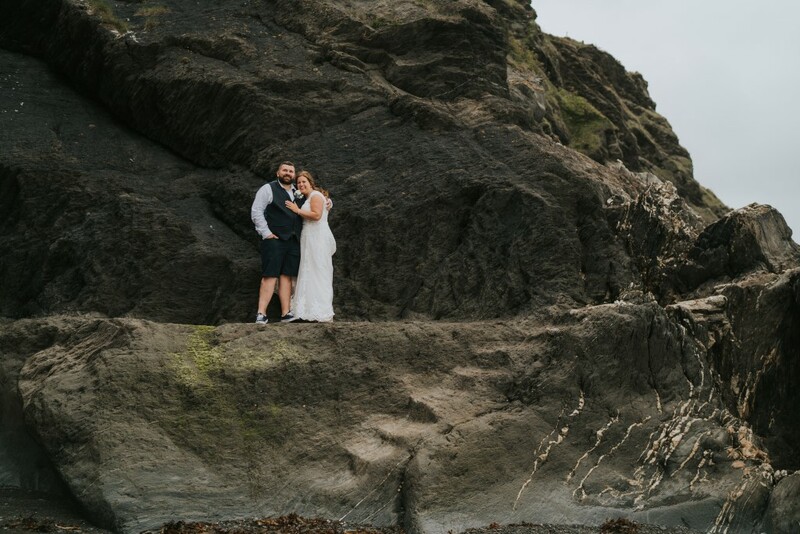 We both love the beach and with our first date and proposal being on a beach, we googled beach weddings and Tunnels stood out from the rest. 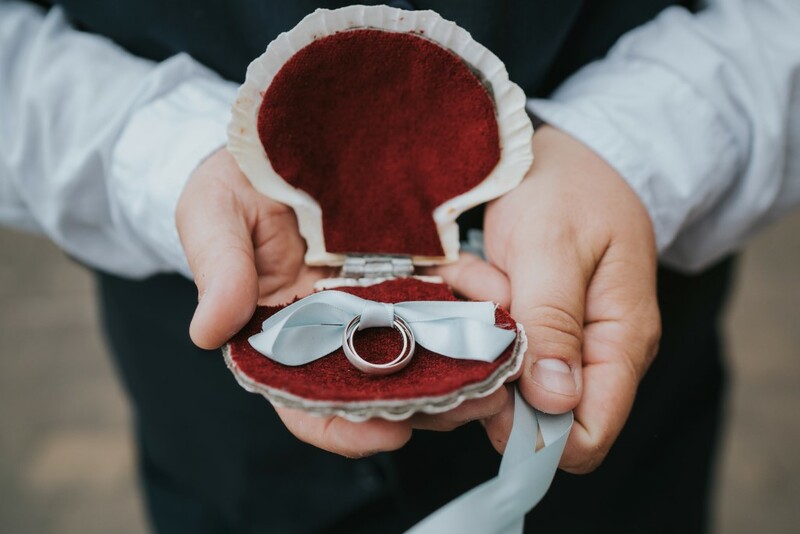 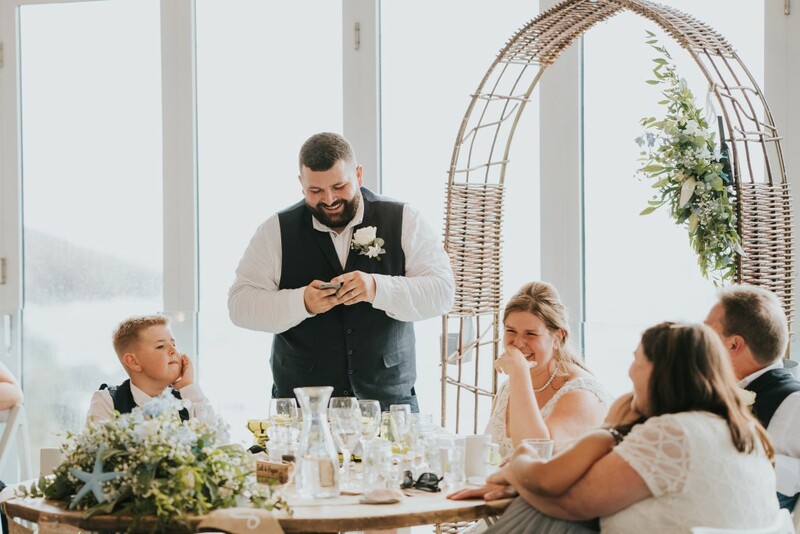 The venue was booked within a week from proposal…everything else was still being planned up to a week before the wedding. 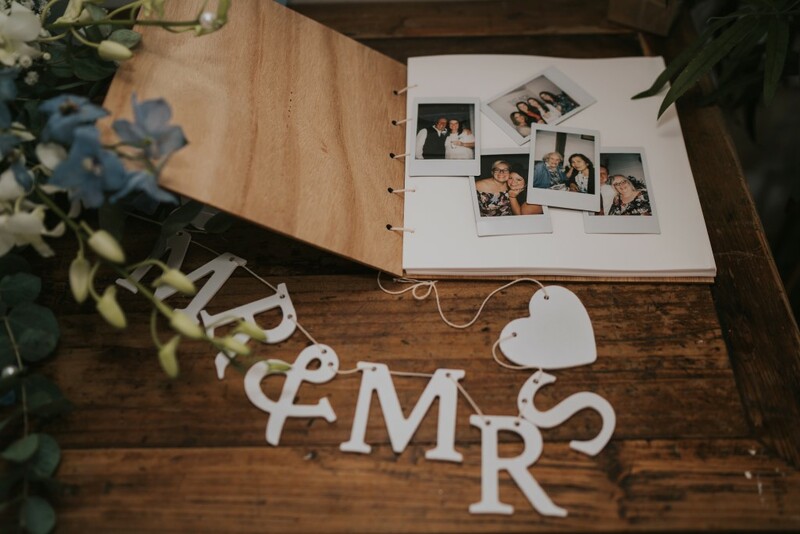 We saved money in bank every pay day from proposal month to the wedding month and didn’t hold back on anything…if we wanted something for the Wedding we saved and got it. 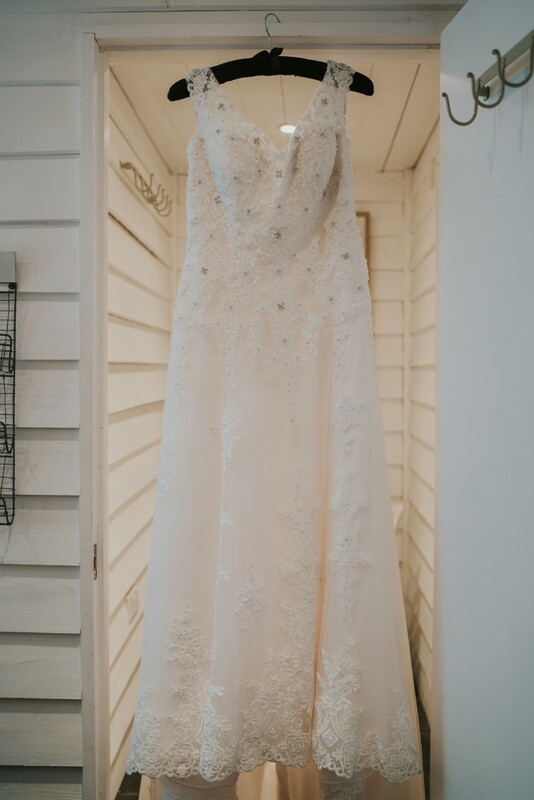 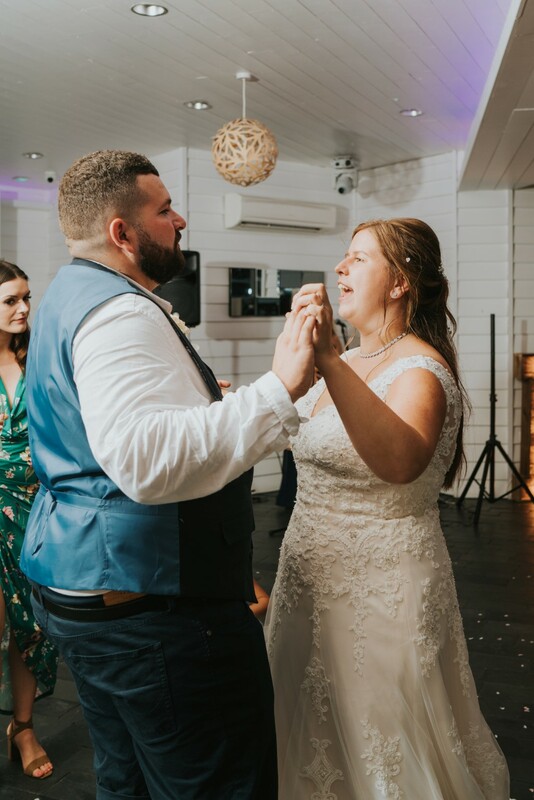 My mum and dad were a help in budgeting by paying for the venue, food and my dress. 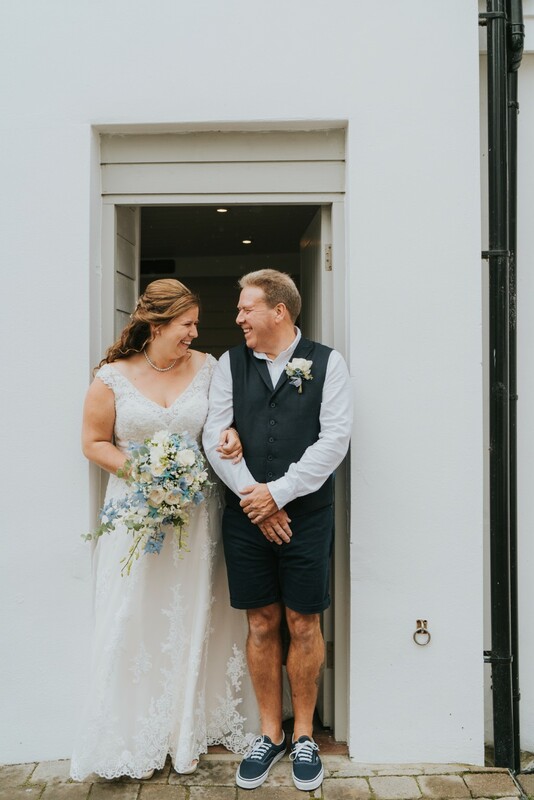 My dress was brought from “Just A Day” bridal shop in Ipswich, and my shoes where from New Look in Ipswich. 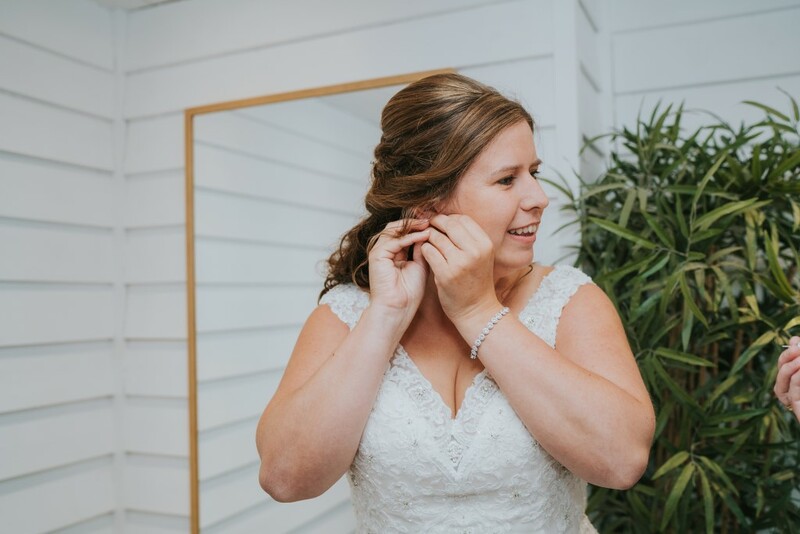 My jewellery brought was a gift from John on the day from Swarovski. 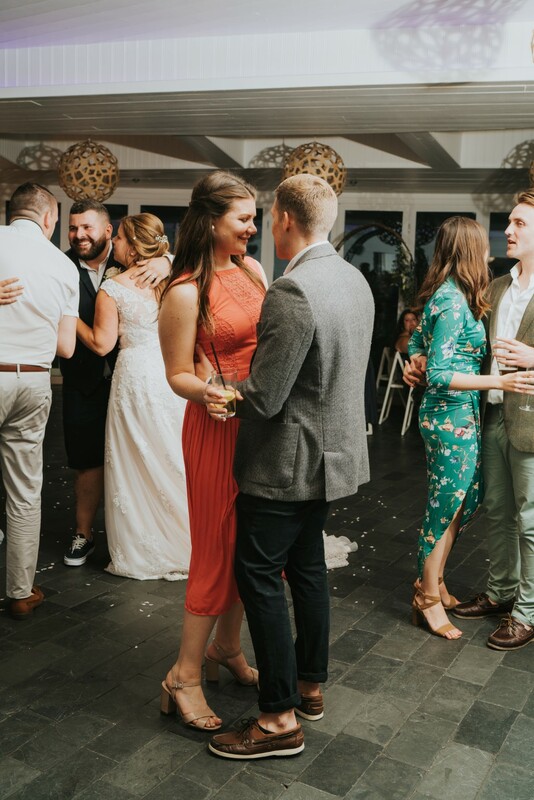 Johns suit was from Joe brown and his shoes were Vans. 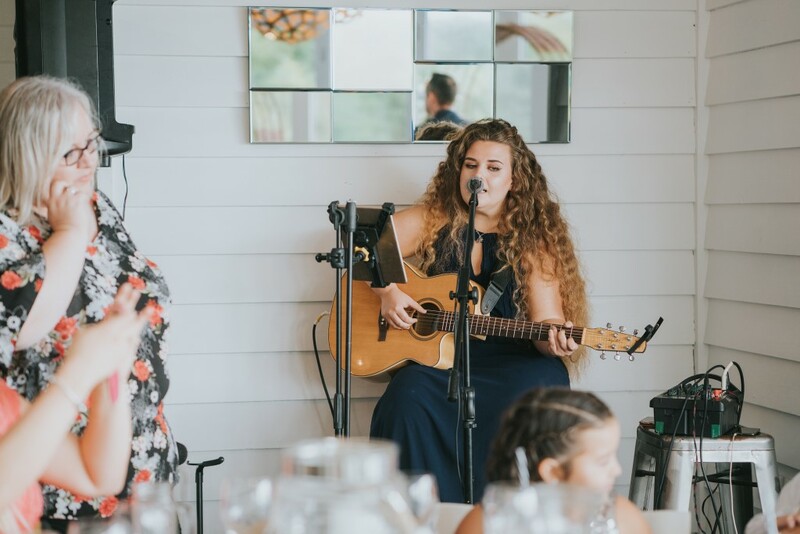 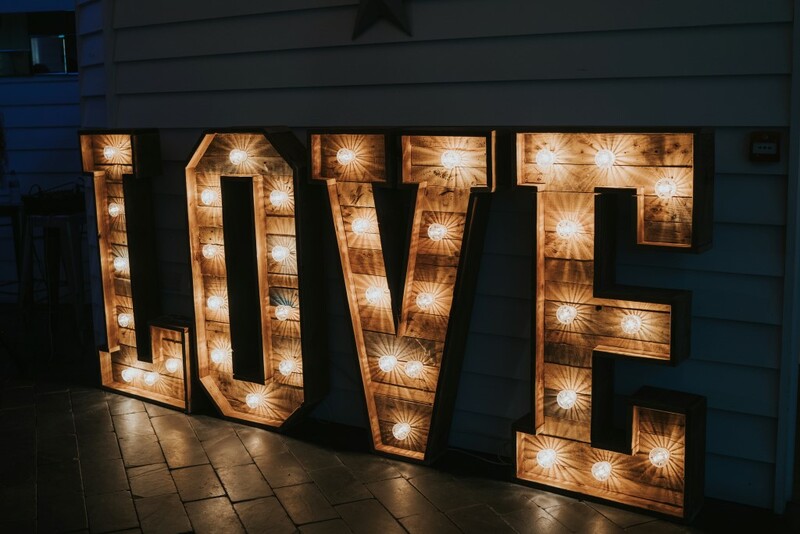 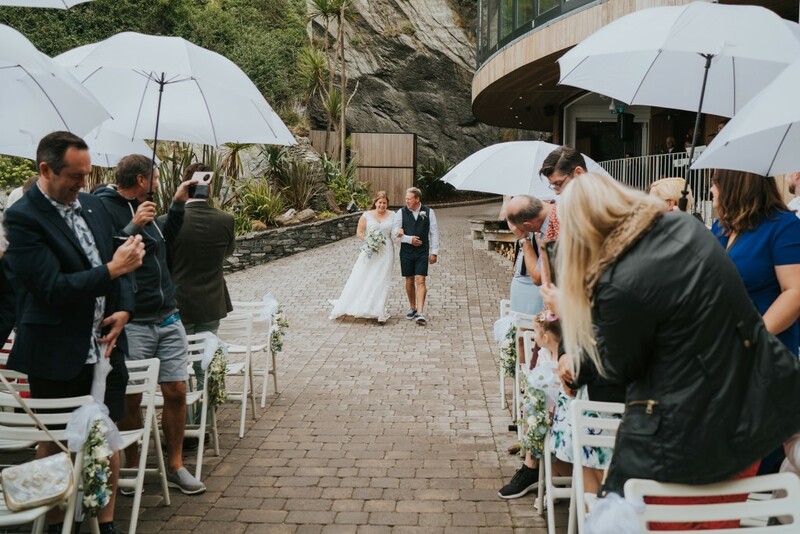 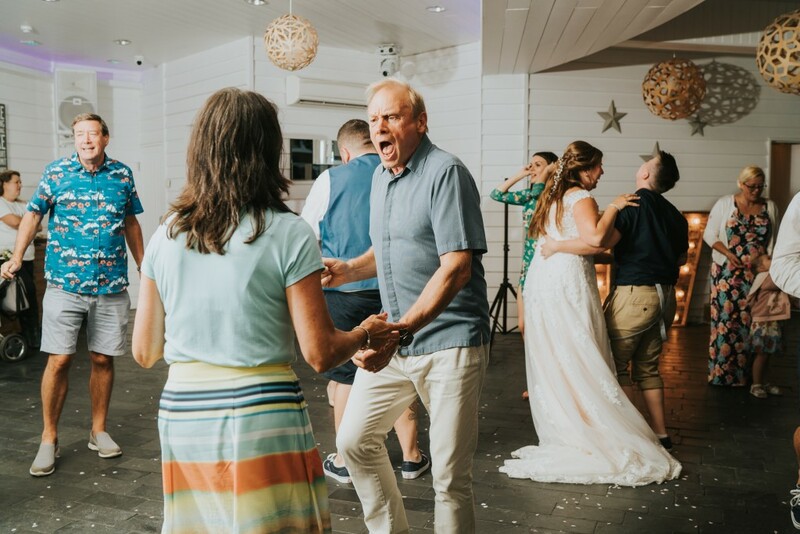 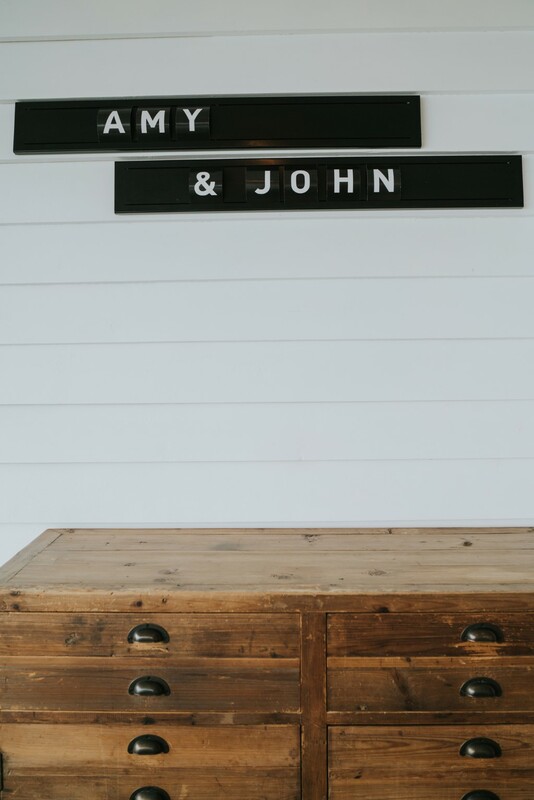 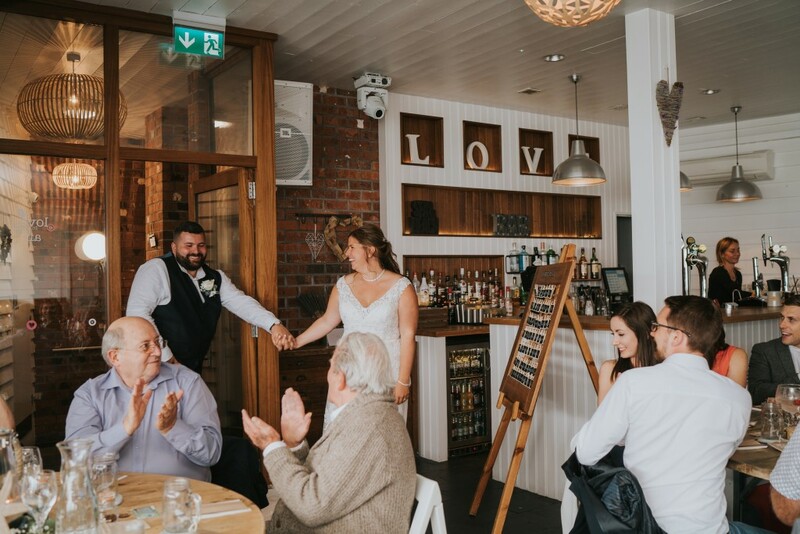 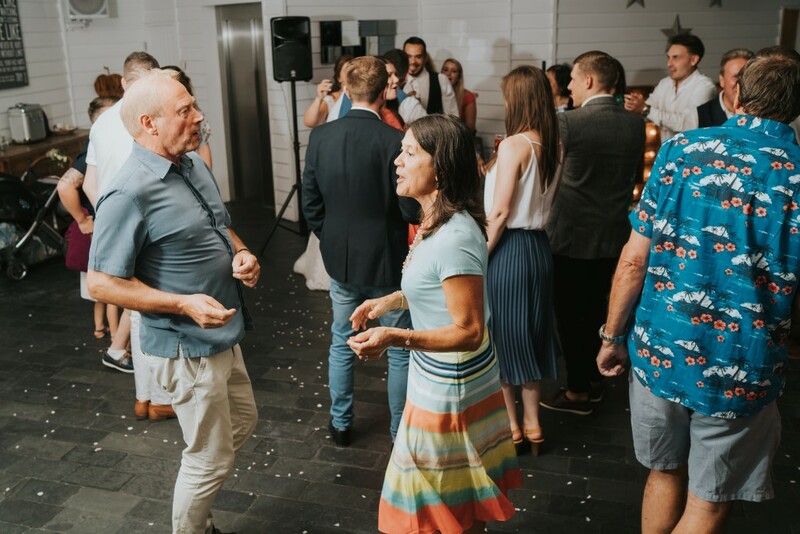 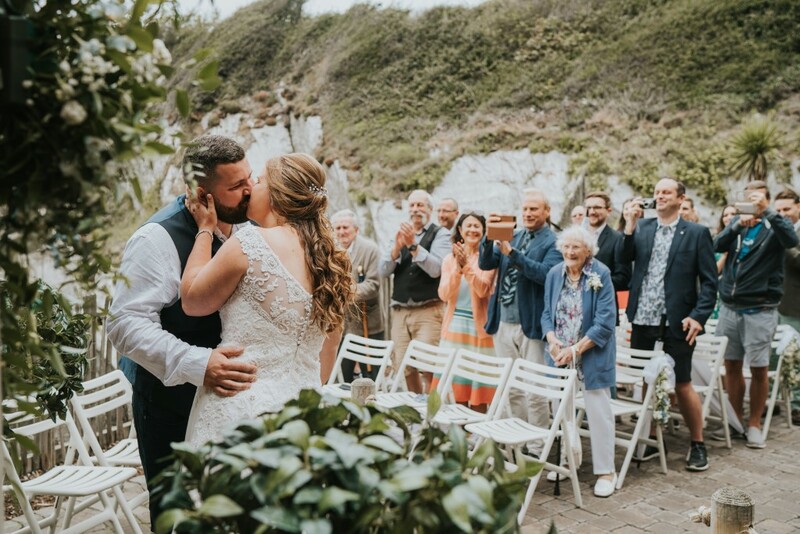 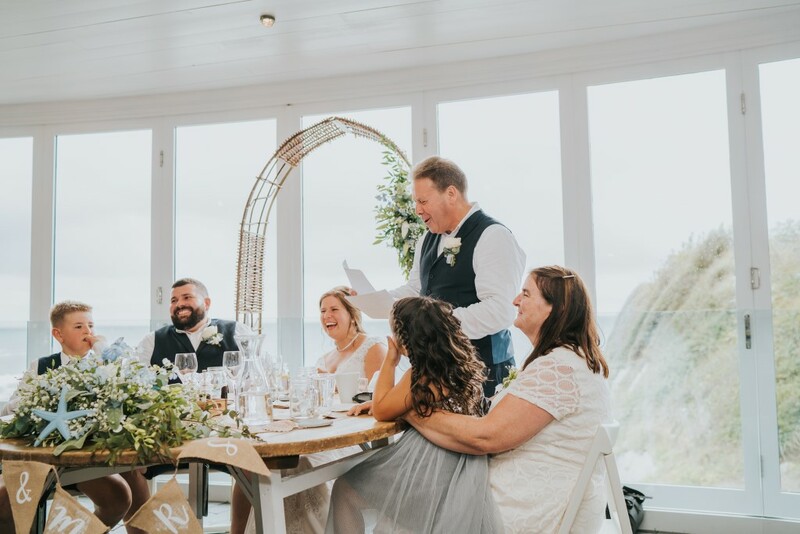 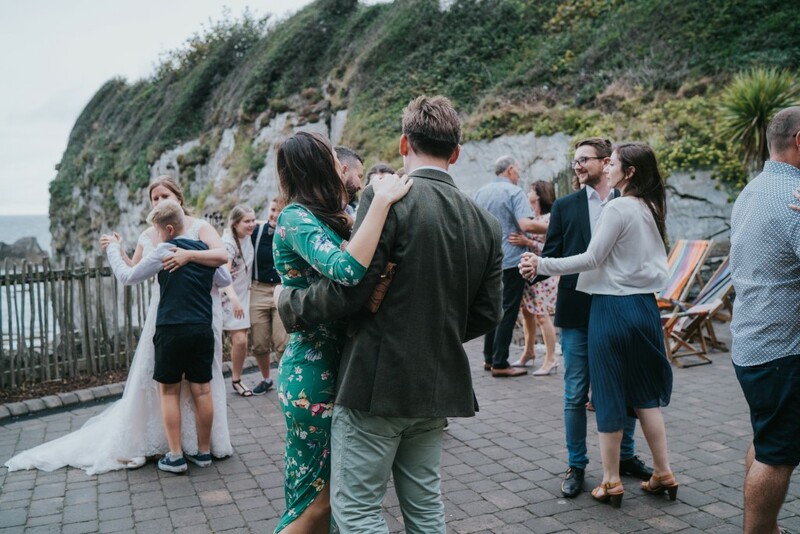 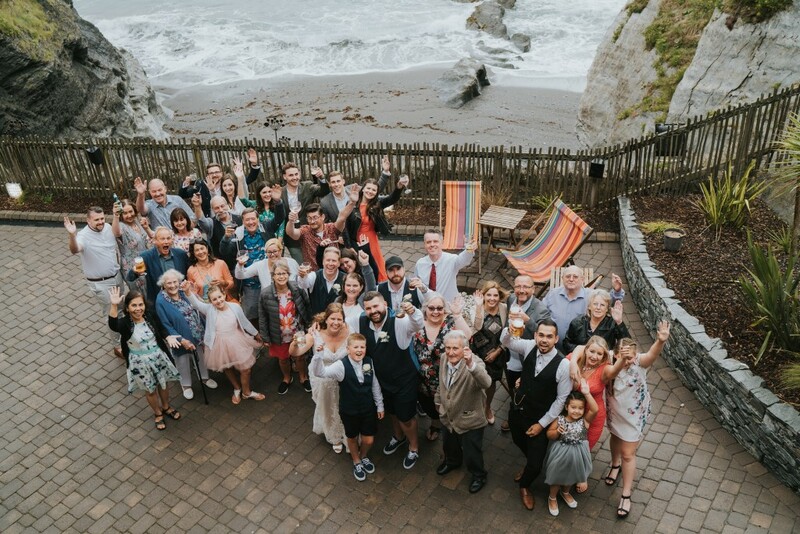 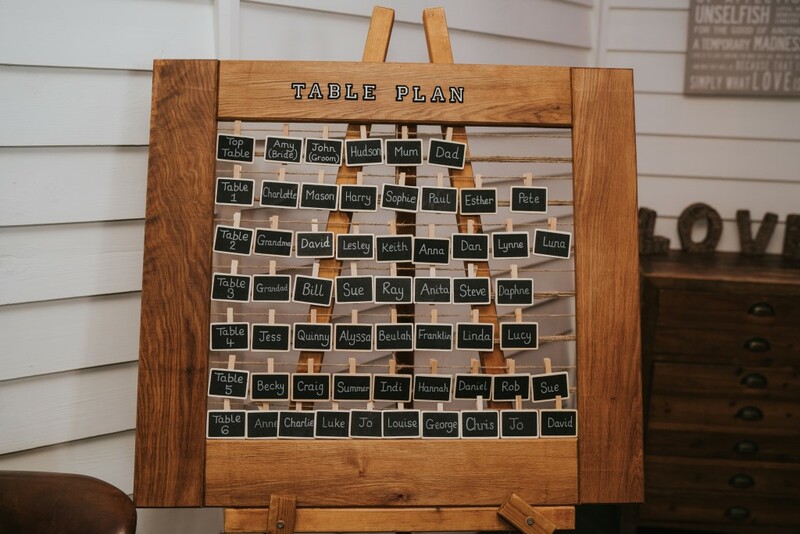 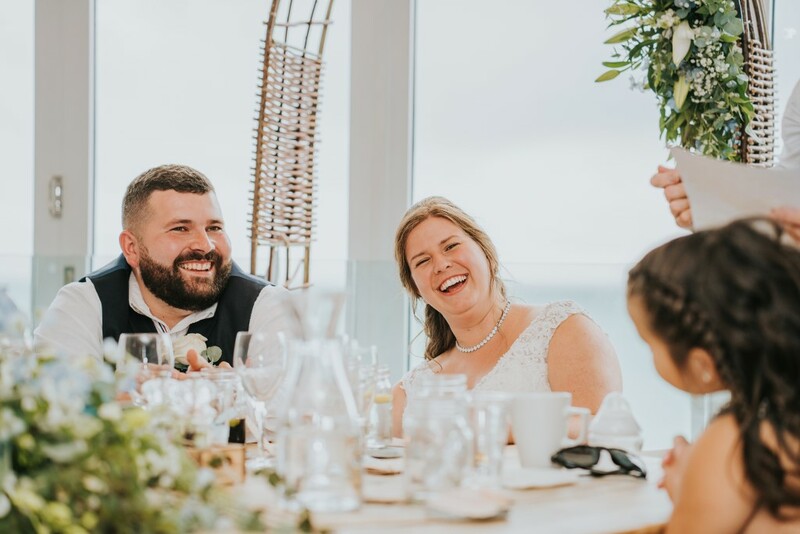 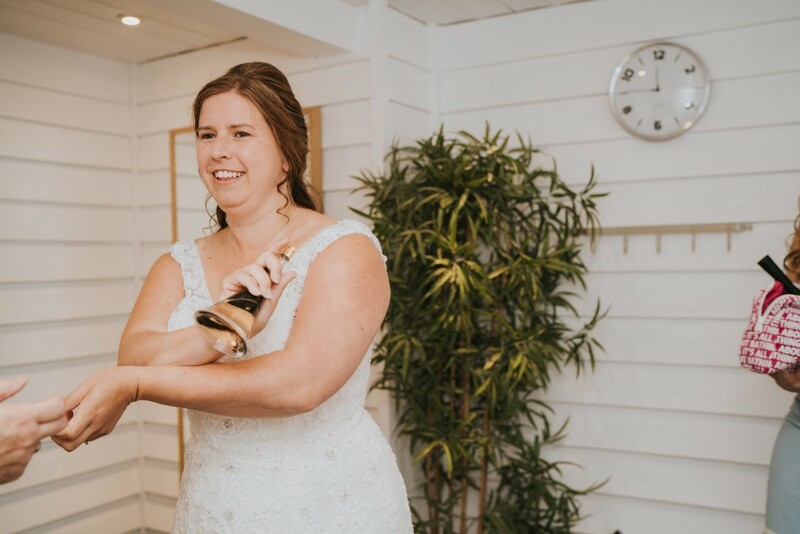 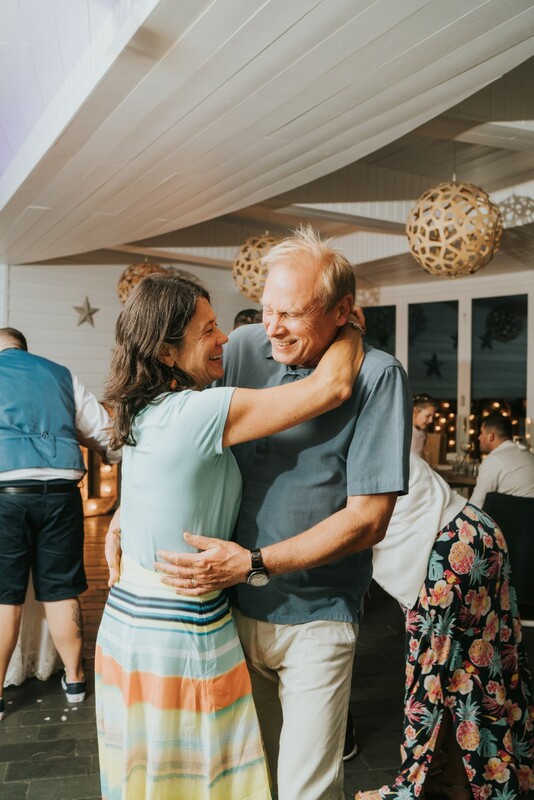 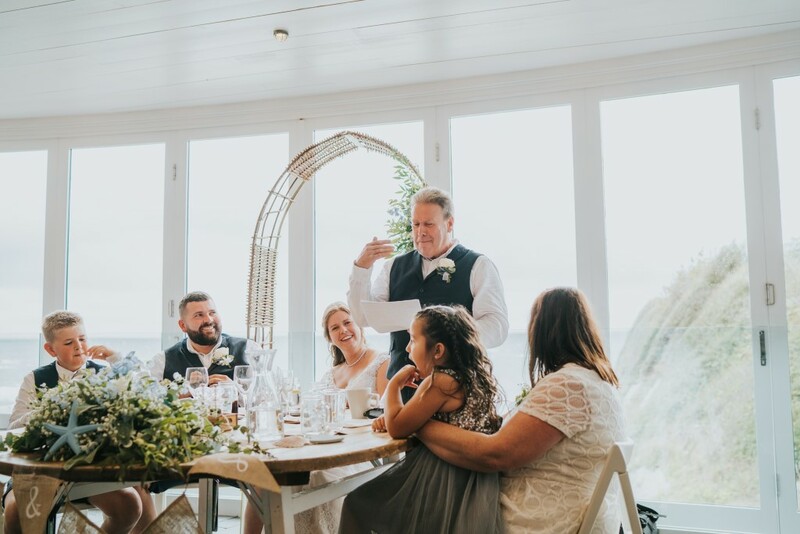 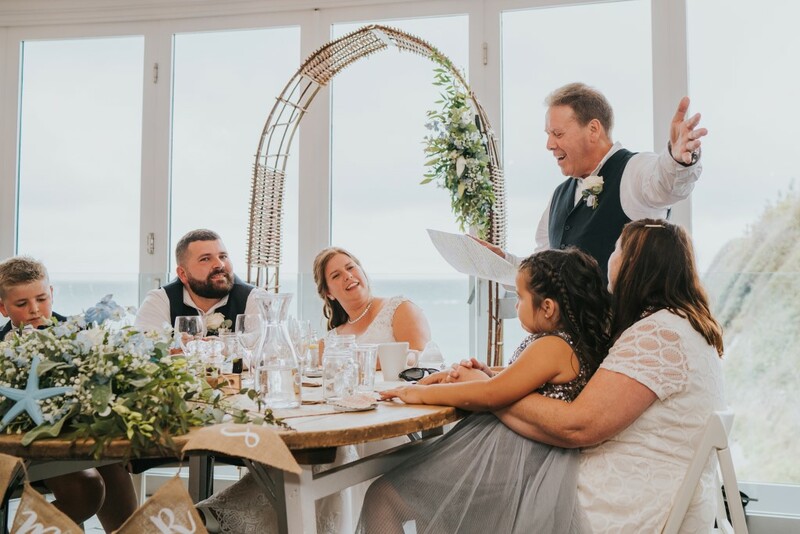 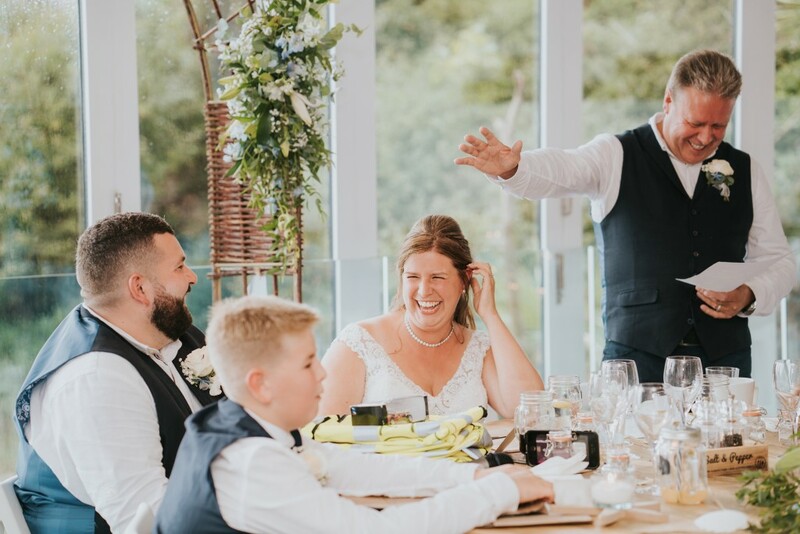 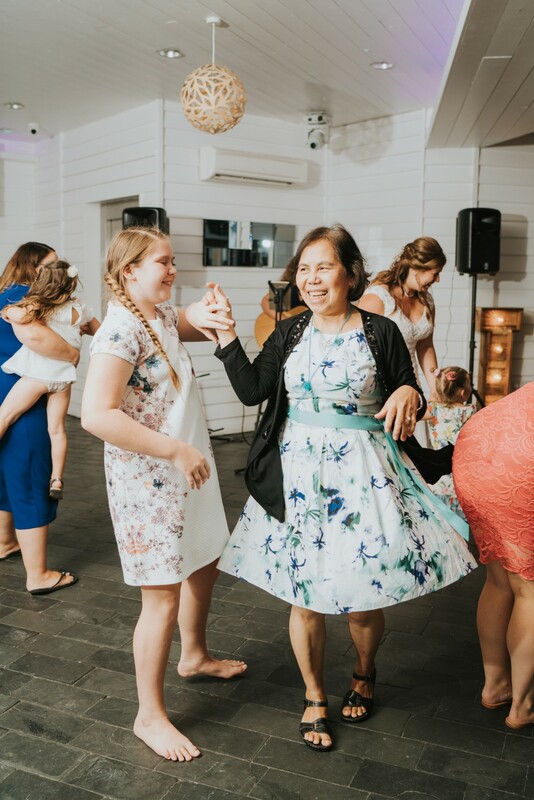 We had 50 guests at our Wedding and the day was like a dream come true…my husband planned it to perfection. 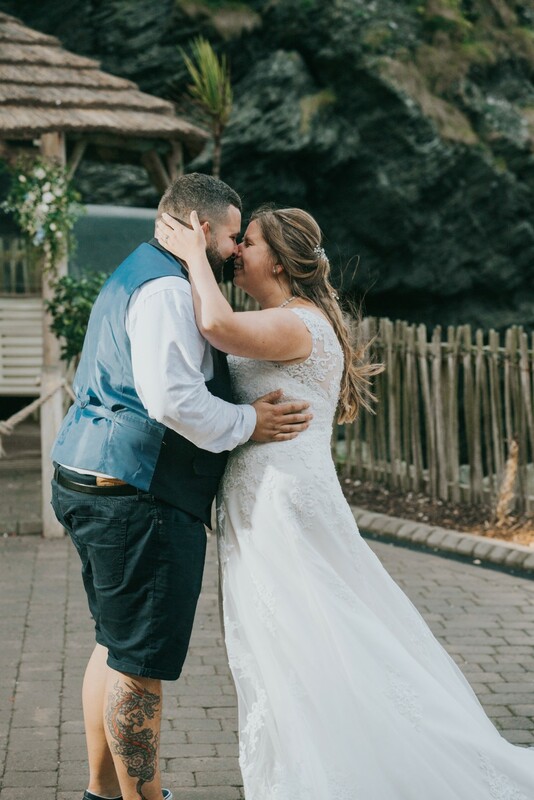 The most magical day when time stood still. 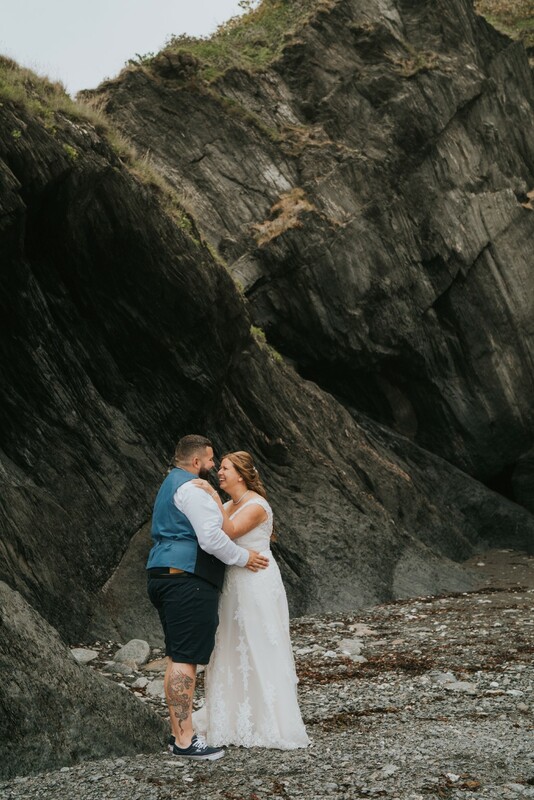 We drove 300 miles from the other side of the country to get married there and not even the rain could have stopped us getting married outside with the amazing setting and outlook it has. 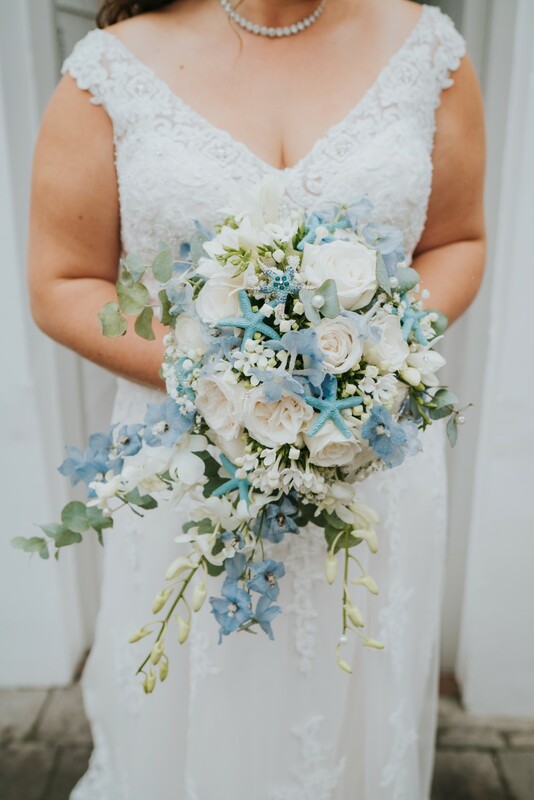 We went with a beach theme with accents of sky blue and white. 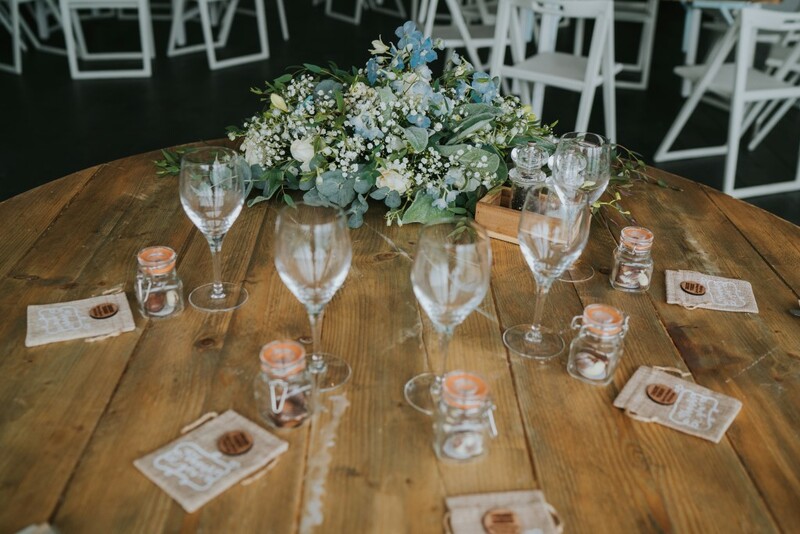 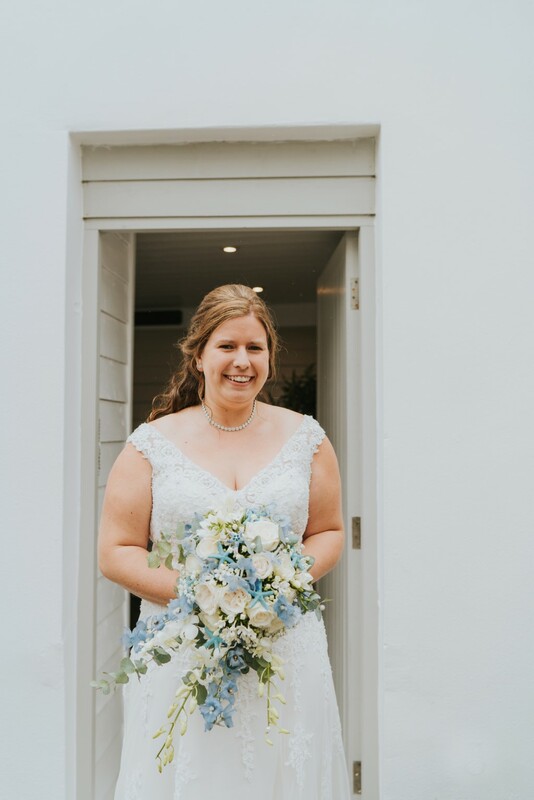 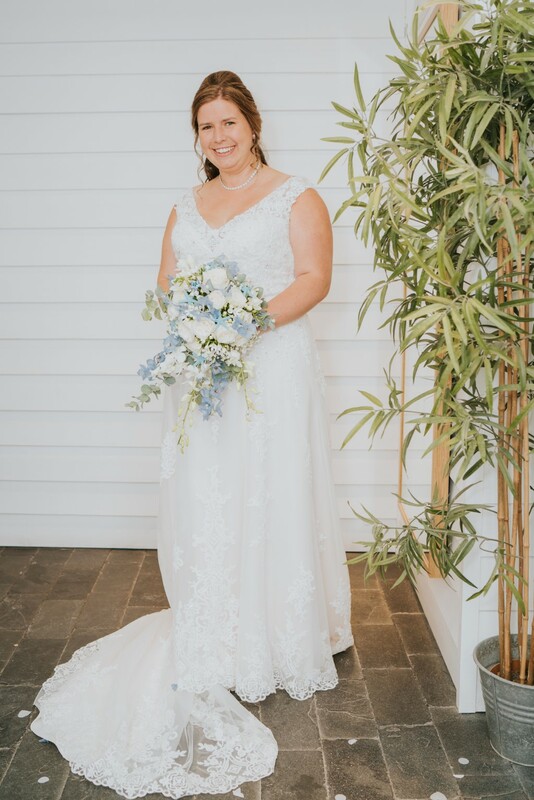 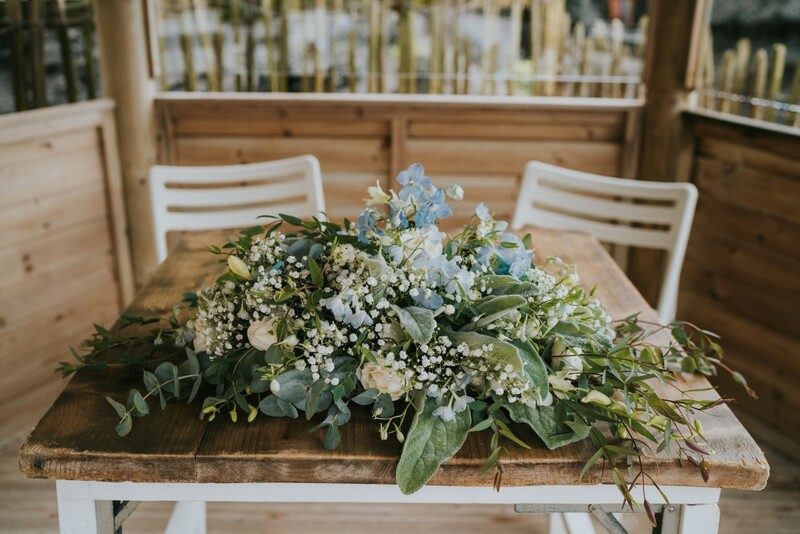 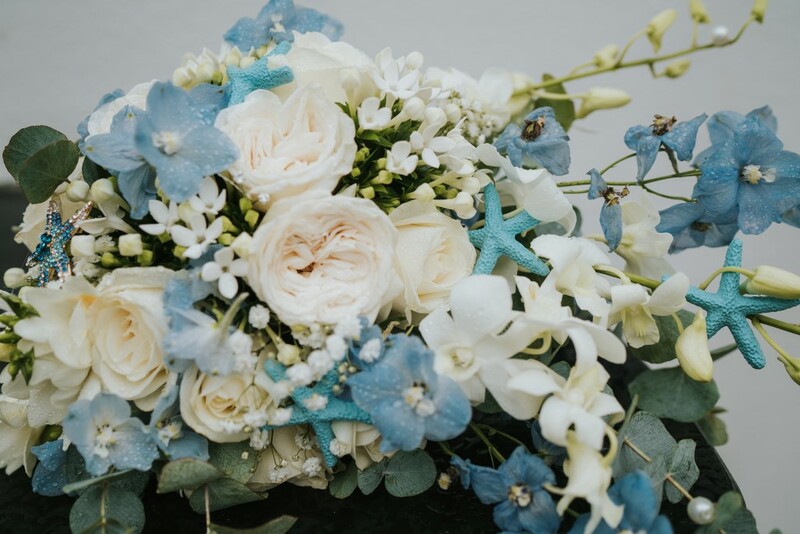 To compliment this theme we had the most beautiful flowers – white azure roses, gypsophila, blue delphiniums, eucalyptus, and white Singapore orchid. 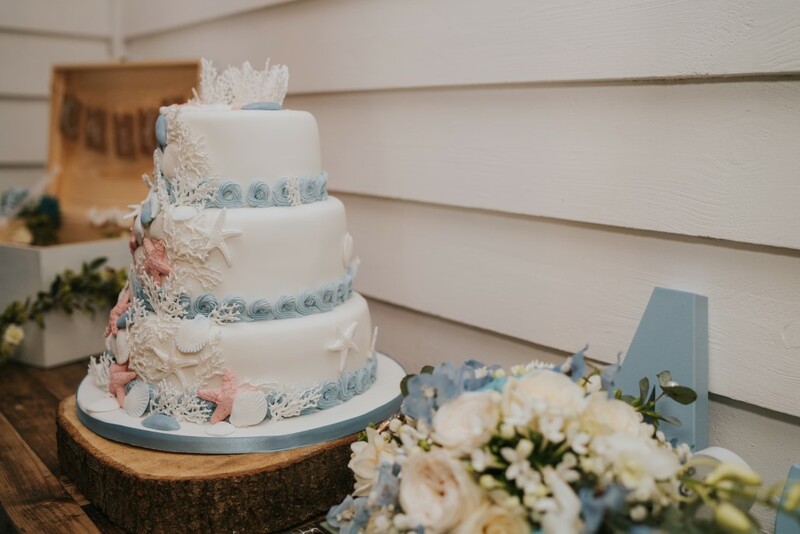 Our wedding cake was a three tier beach theme with shells and starfish…lemon, chocolate and Victoria sponge made by Cantel Cakes. 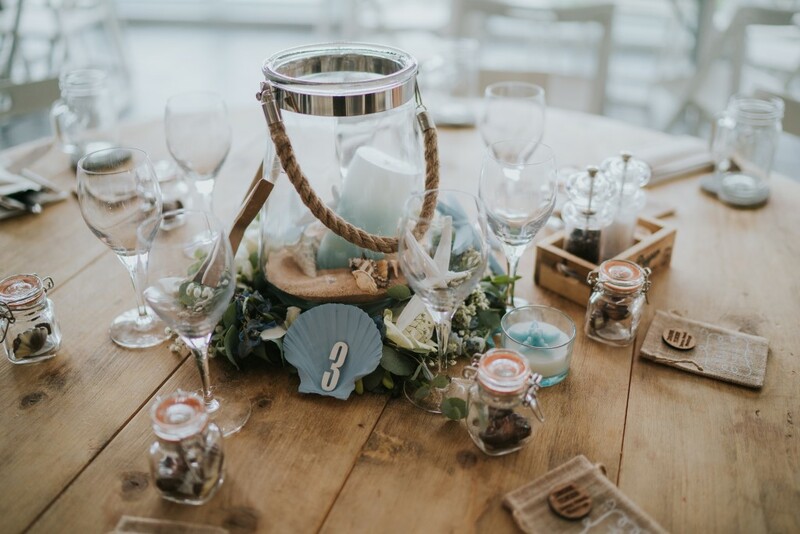 The ring clam shells was made by John, table plan was made by John, invites where handmade by me. 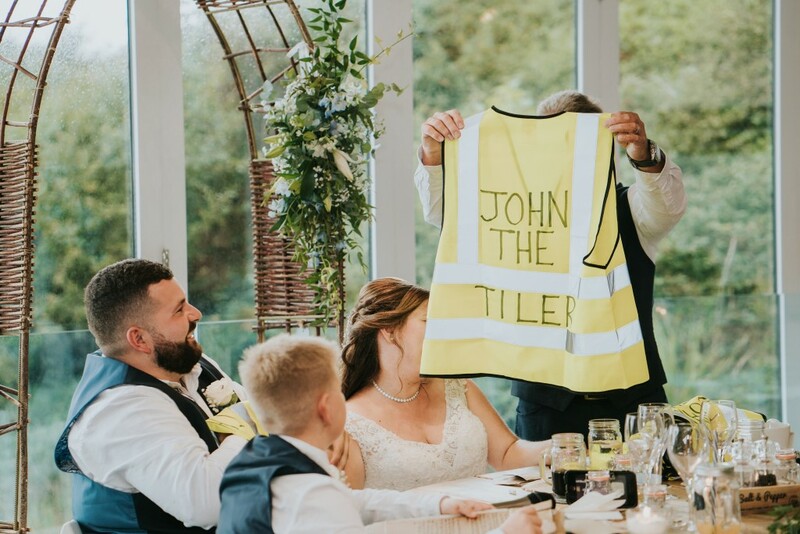 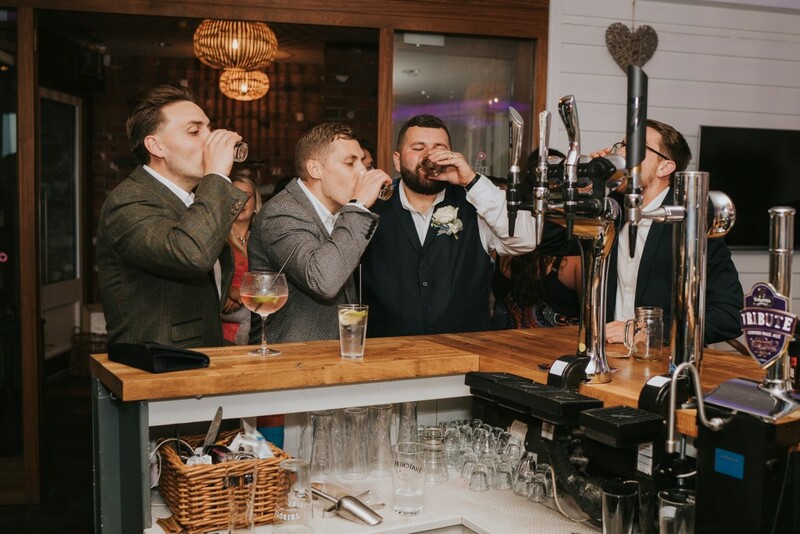 The whole wedding was made to be a representation of us. 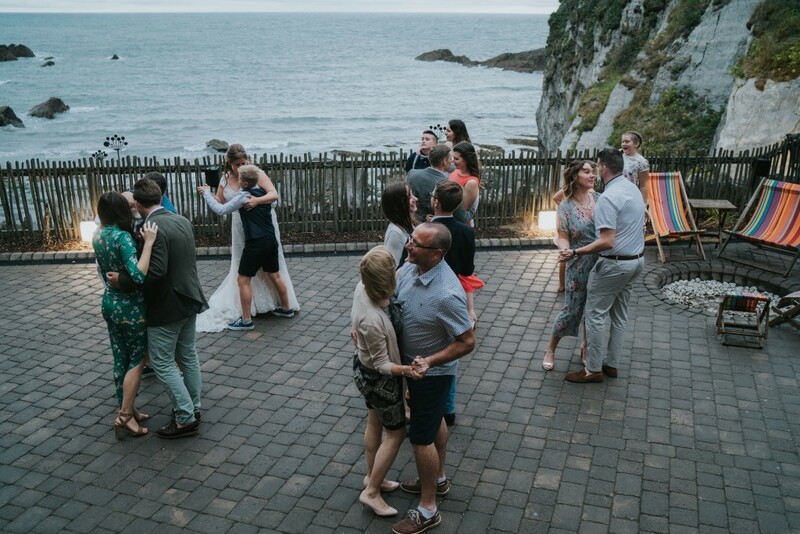 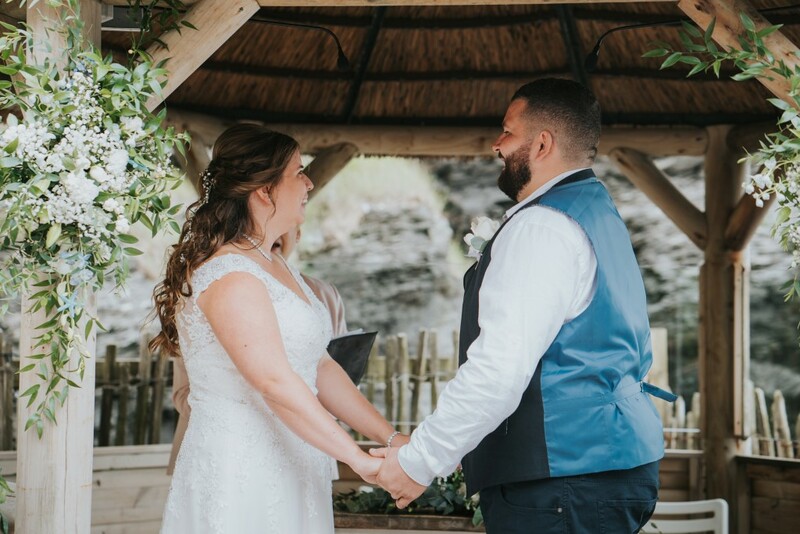 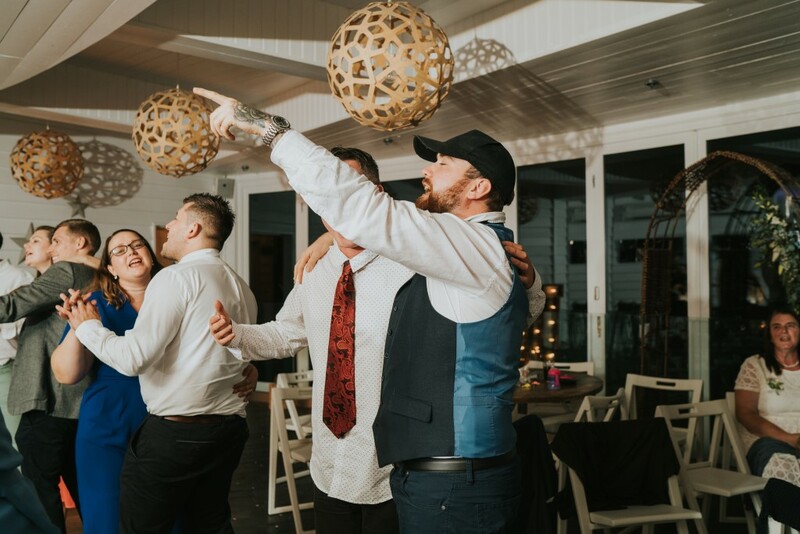 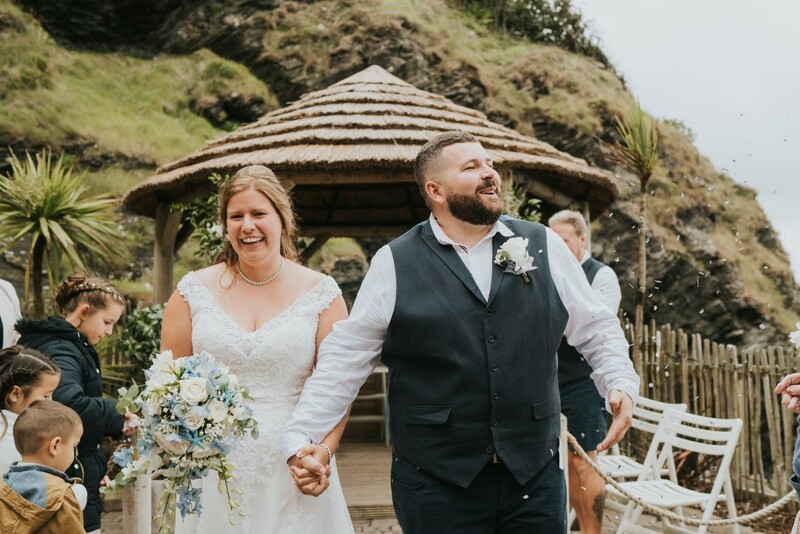 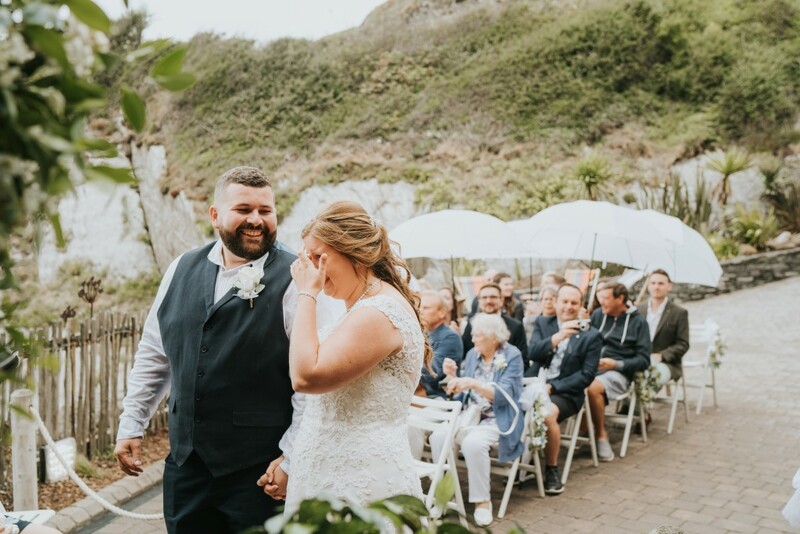 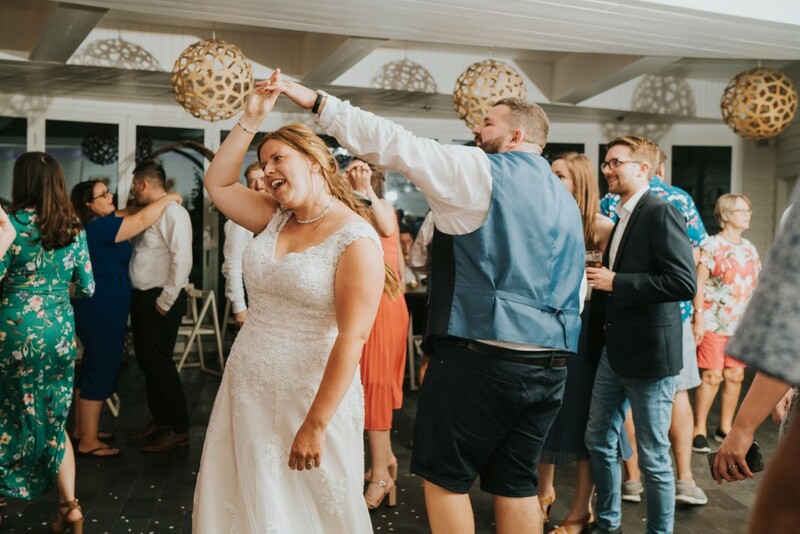 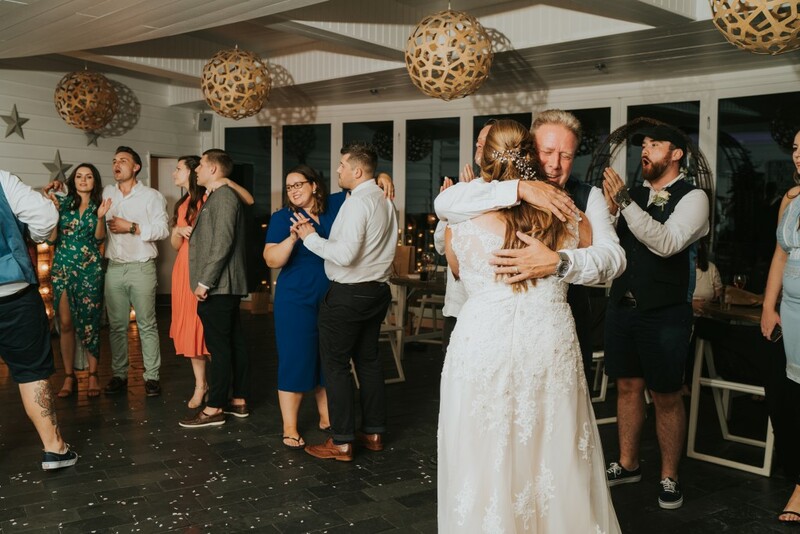 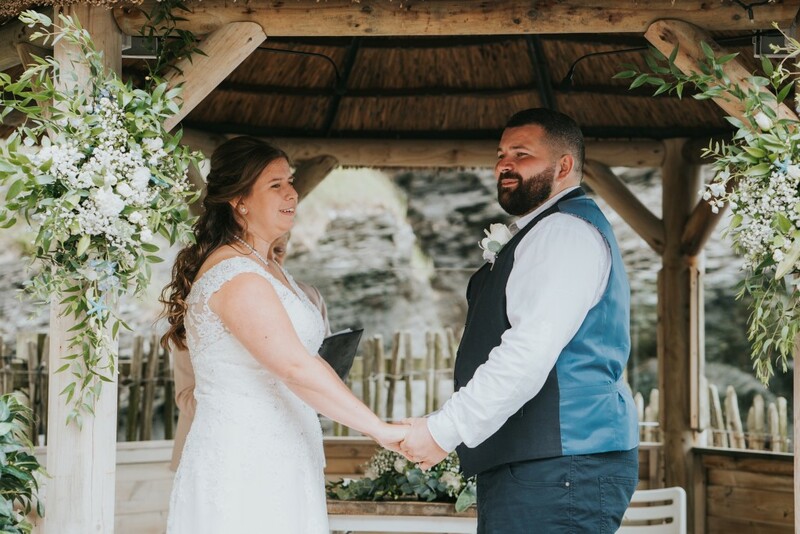 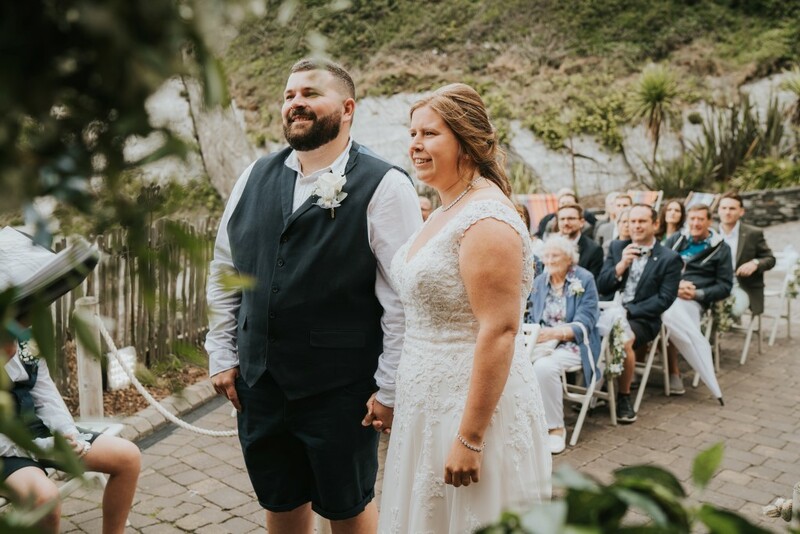 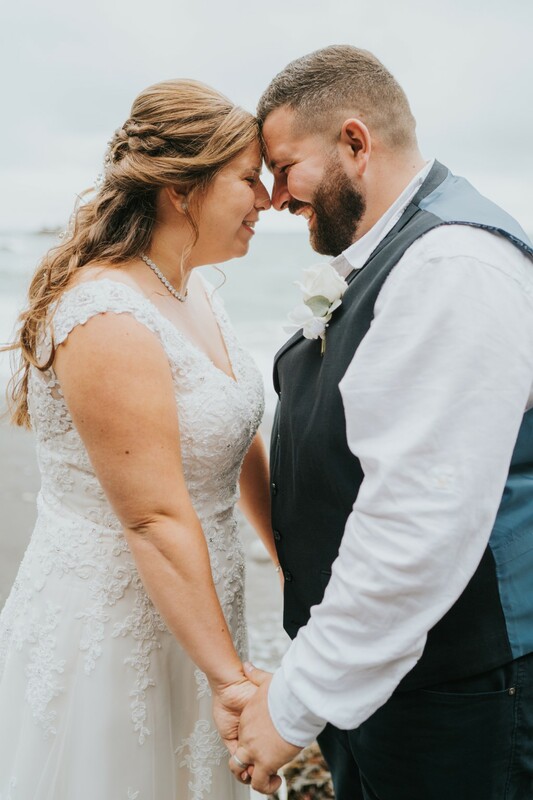 Being able to have the ceremony and first dance outside with the view of the beach was just perfect and exactly what we imagined it to be like. 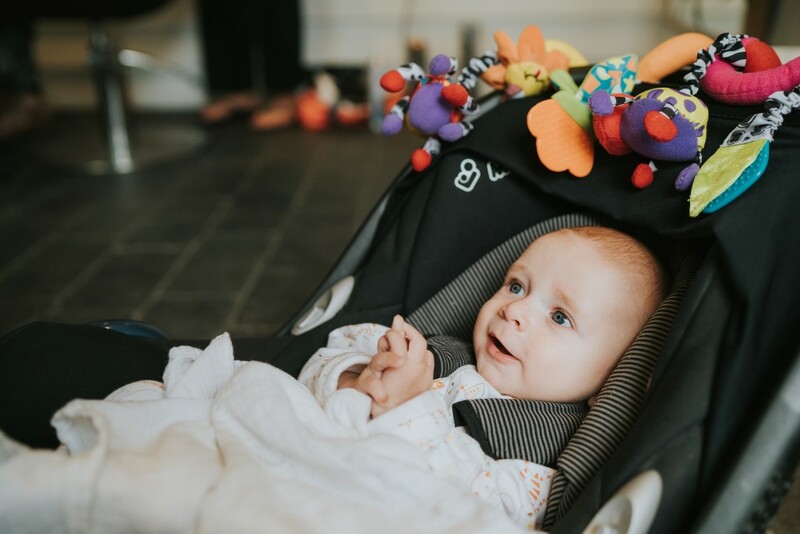 Make the most of it, and enjoy every second taking in every part and detail of the whole day because it will be over before you know it.